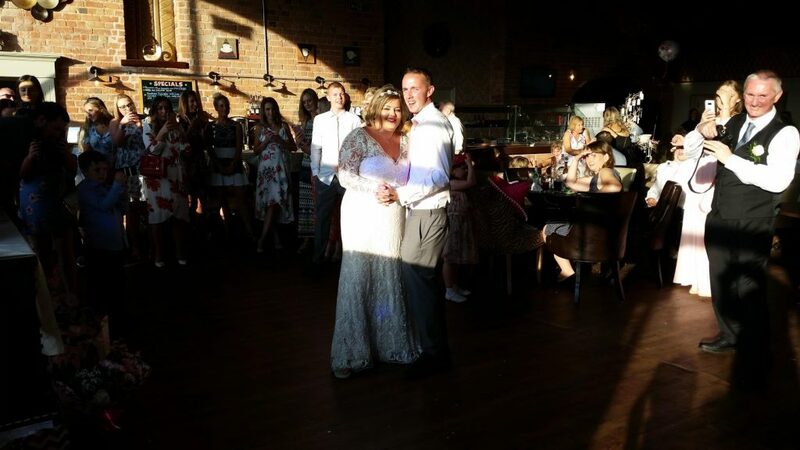 Mr and Mrs Morgan Celebrate their wedding. 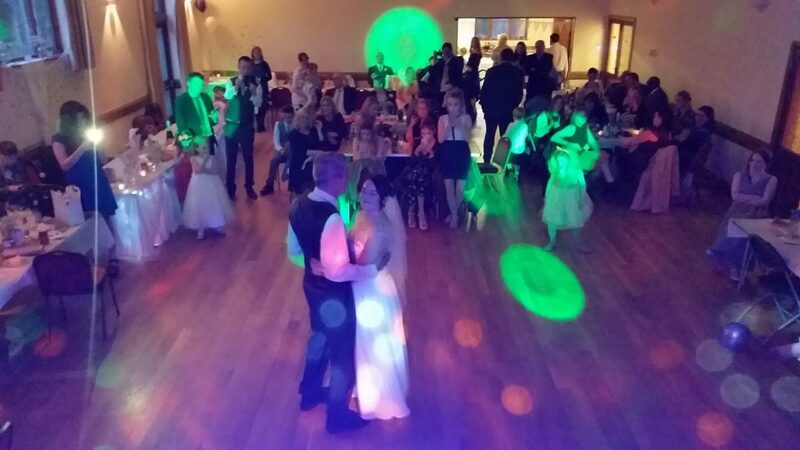 First Dance and Evening reception. 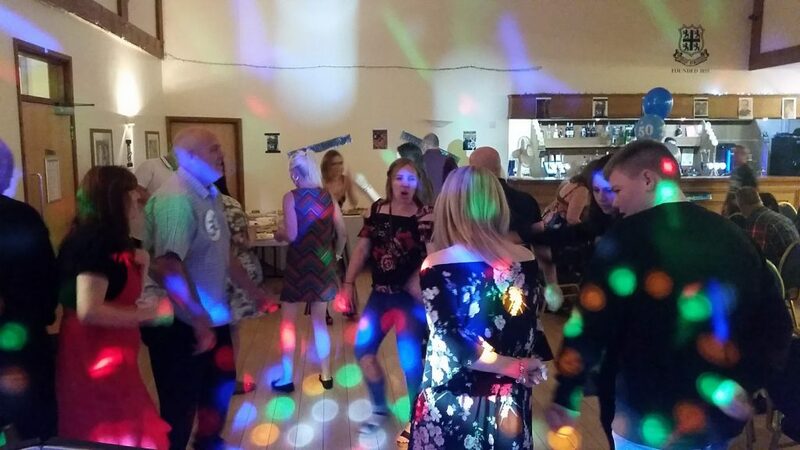 Comrades Club – Ellesmere. 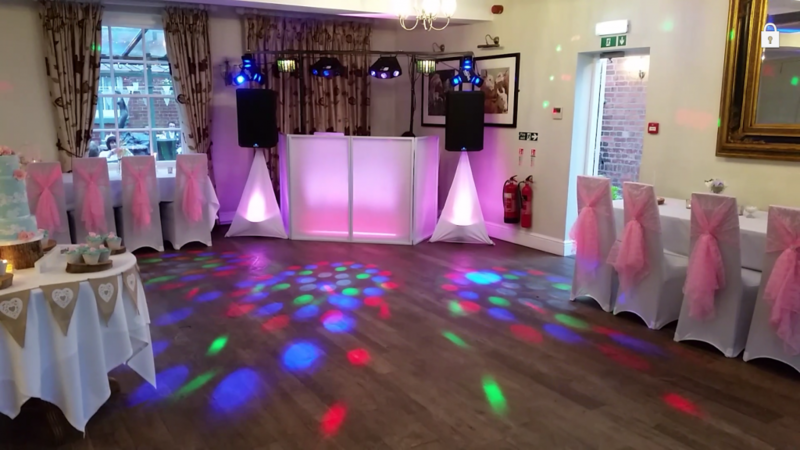 How gorgeous does our pink up-lighting and colour-wash look? 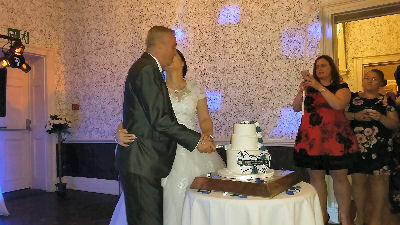 Mr and Mrs Williams cut their cake and prepare for their first dance. 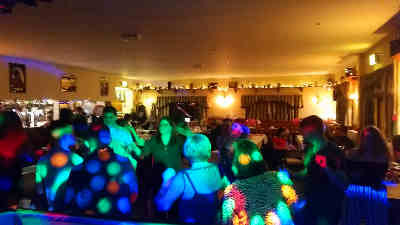 The Sweeney country house hotel. 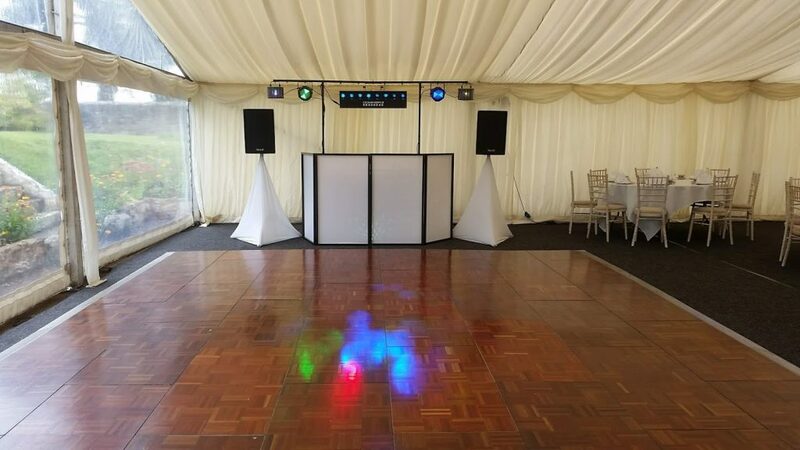 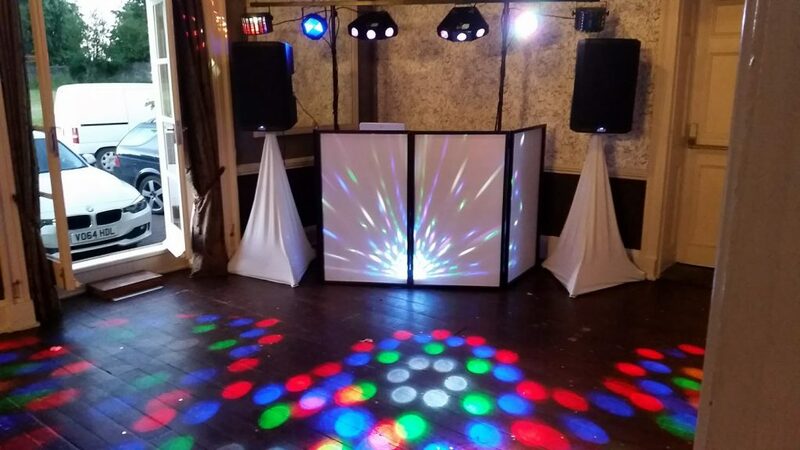 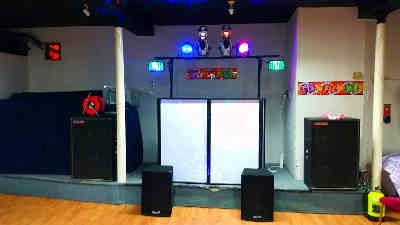 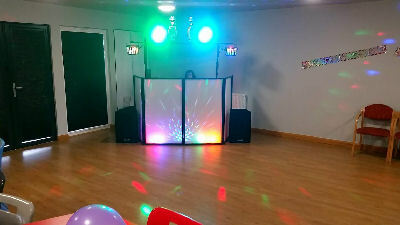 Alison hired music equipment from us for her 50th Birthday bash. 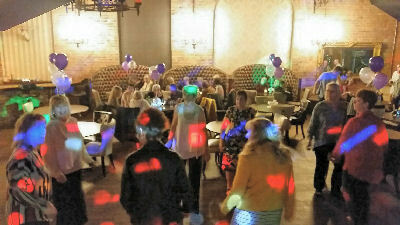 Kay celebrates her 60th Birthday with gold… Motown gold 🙂 A full night of Motown and Soul music. 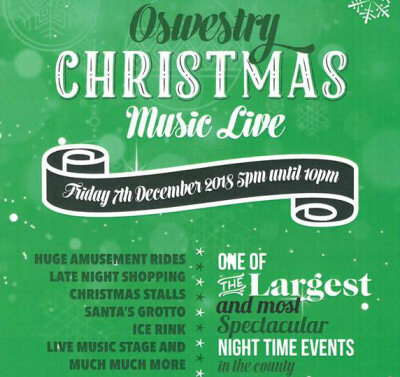 Carriages – Oswestry. 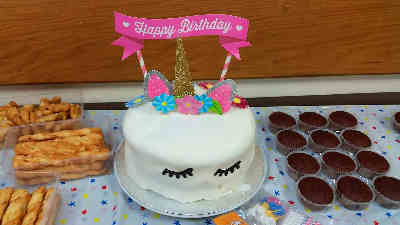 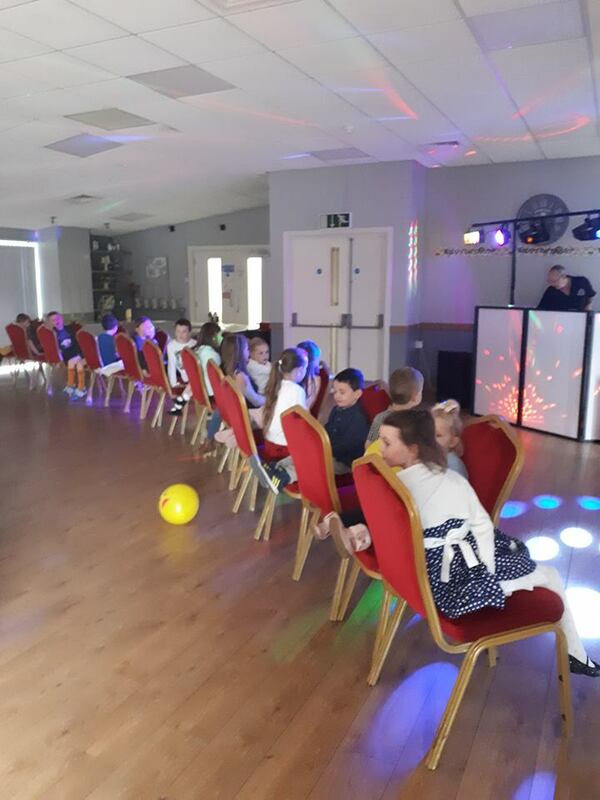 Evie celebrated her 7th Birthday with a disco and games. 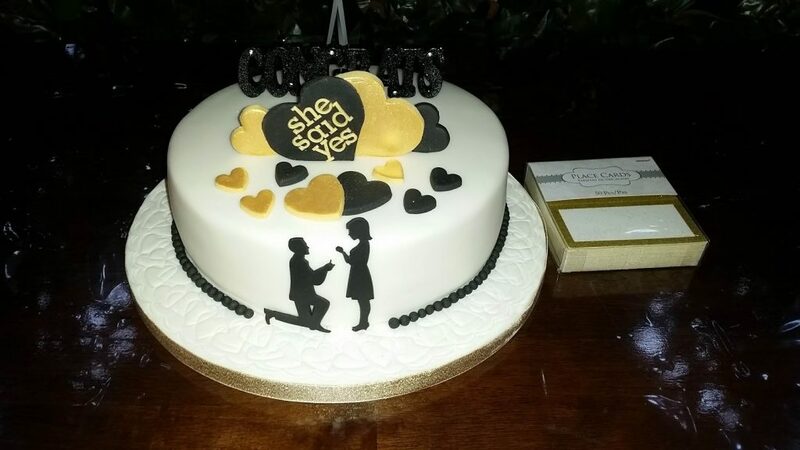 Impressive cake indeed! 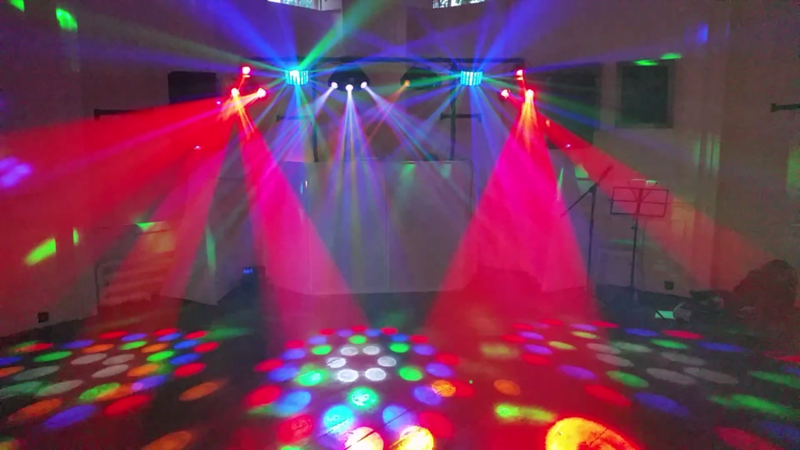 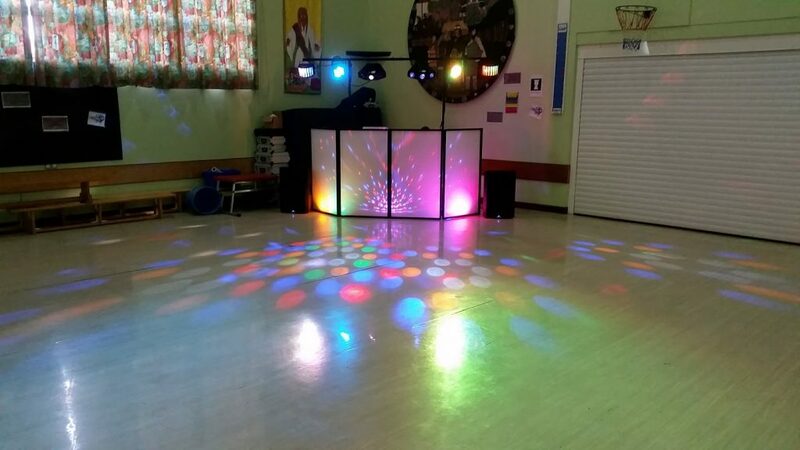 More child disco parties, More cake and more colourful lights! 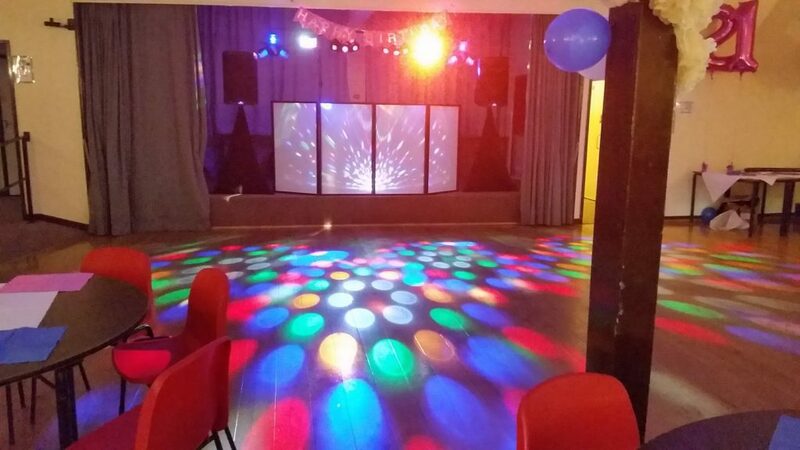 4th Birthday Party at Oswestry Gatacre Pavillion and a 6th Birthday at West Felton Village Hall. 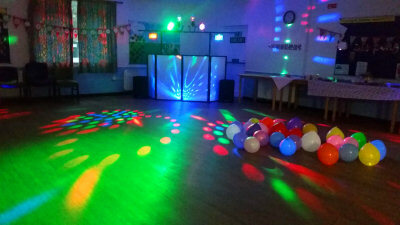 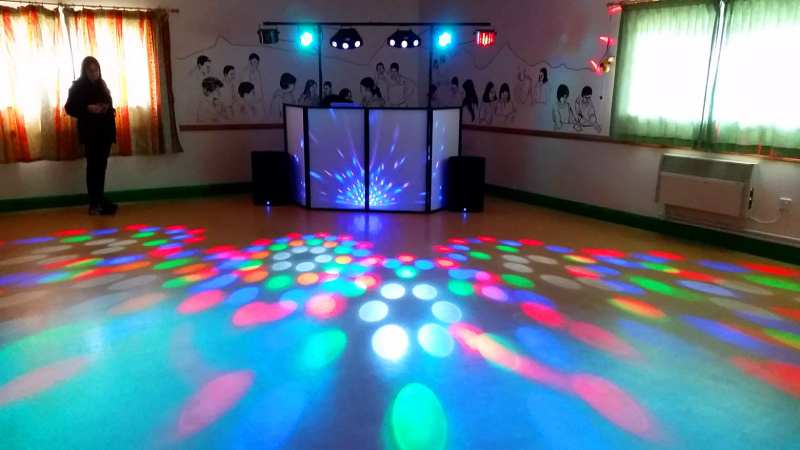 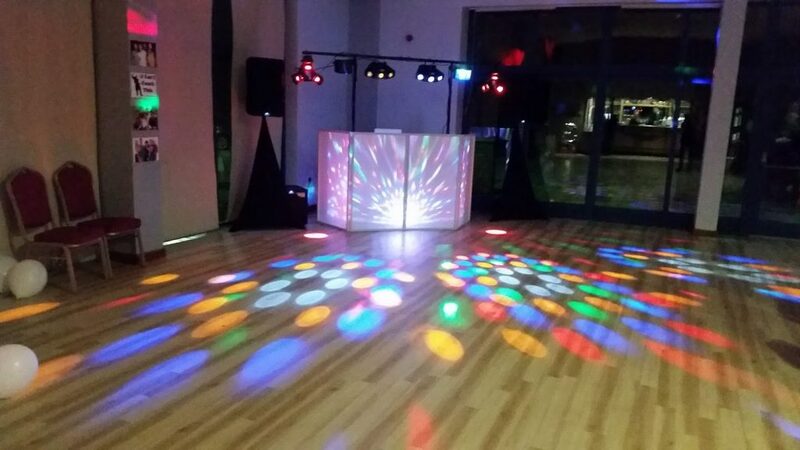 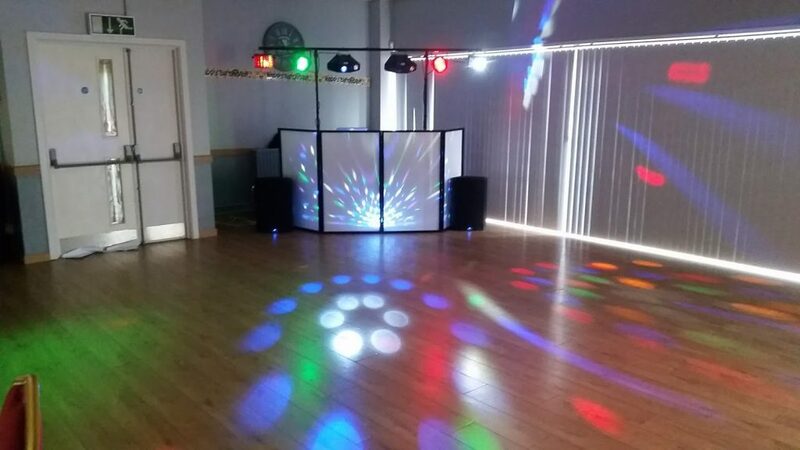 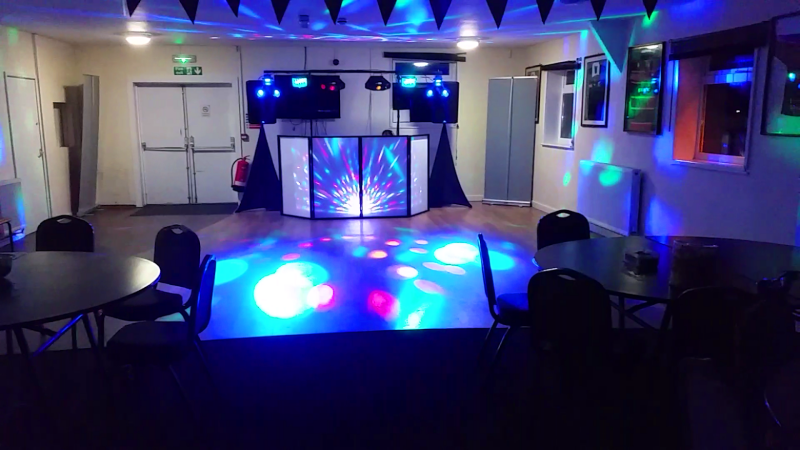 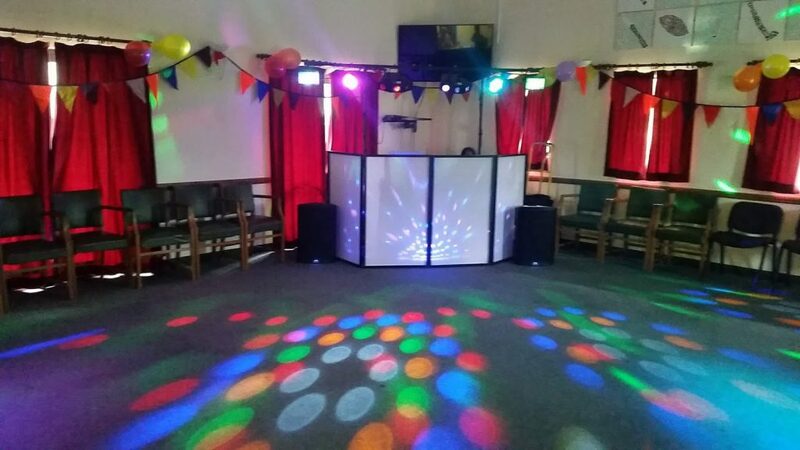 Aiszinn’s 5th Birthday Disco Party – Oswestry Gatacre Pavillion. 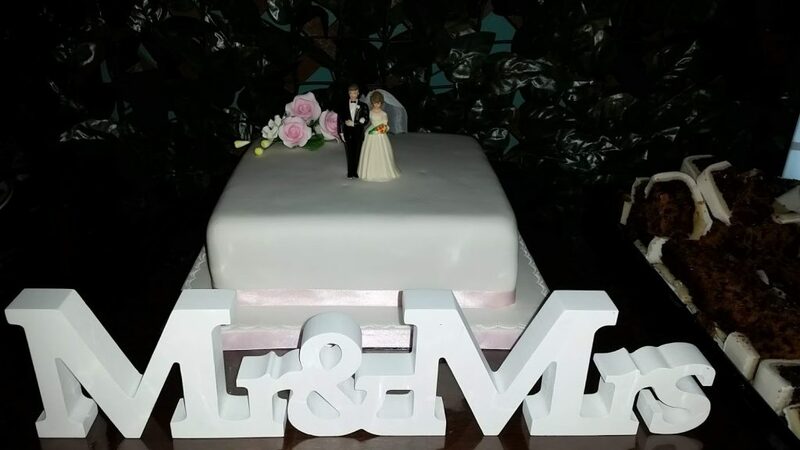 We love that cake! 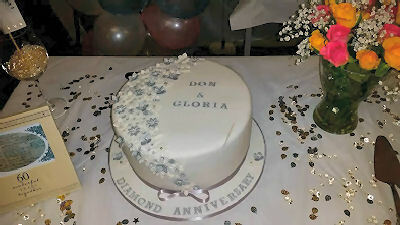 John & Pauline, Don & Gloria all celebrated their Diamond (60th) Wedding anniversaries together… Definitely a reason to celebrate! 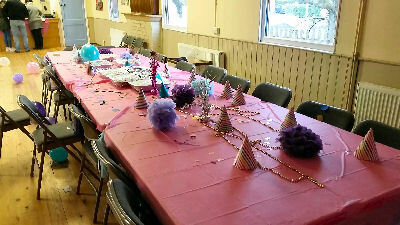 Child Parties a plenty. 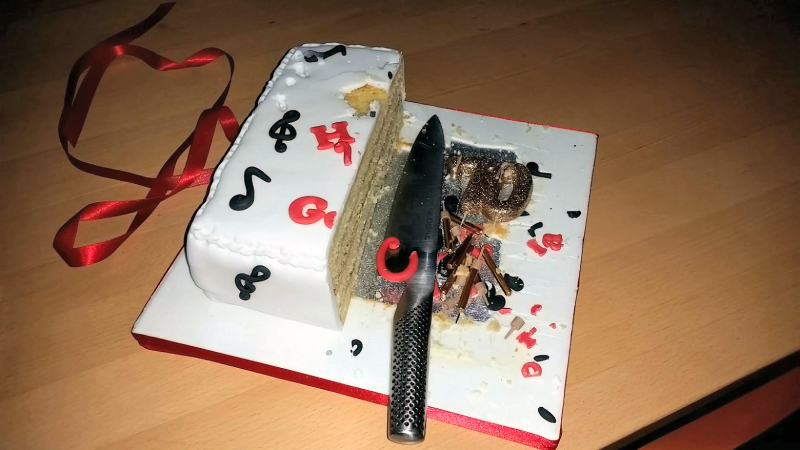 Another lovely birthday cake. 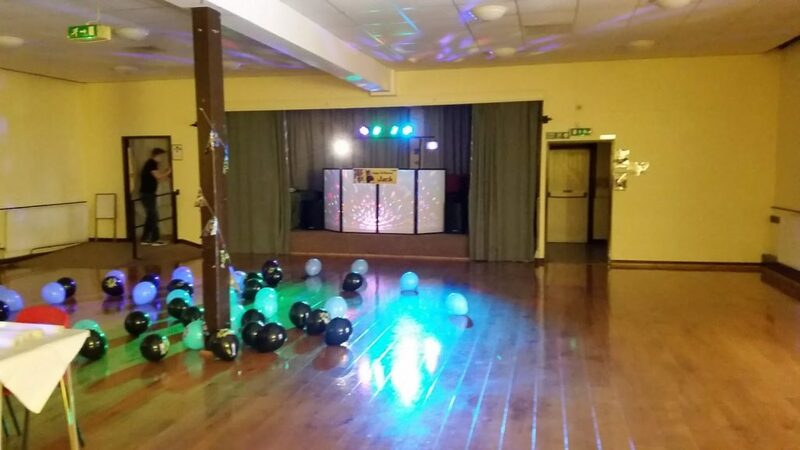 Welshpool Scout Hut. 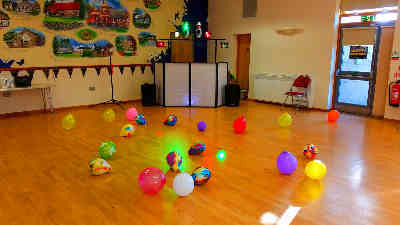 3rd and 4th Birthday Party, St Martins Community Centre. 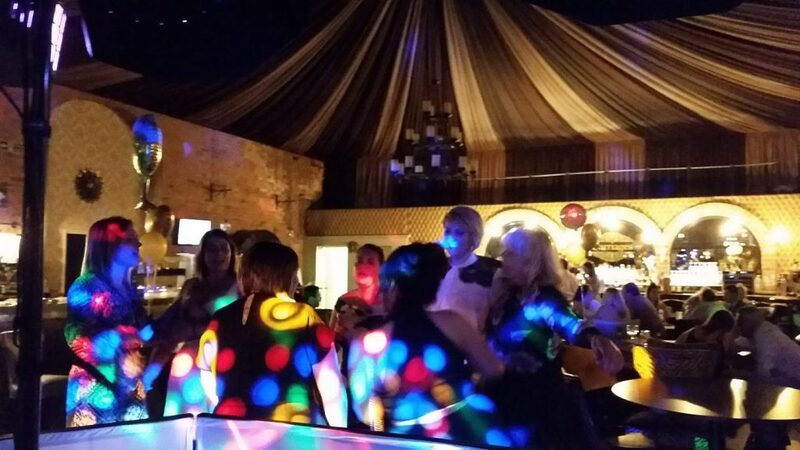 Happy New Year and Happy Birthday Lauren 🙂 Party time at Carriages, Oswestry. 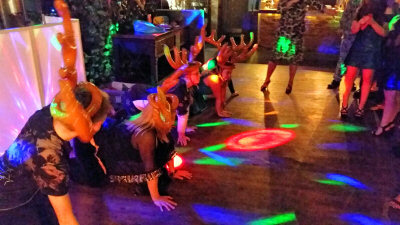 A late Christmas Party (Fancy Dress of course) for a Local medical centre. 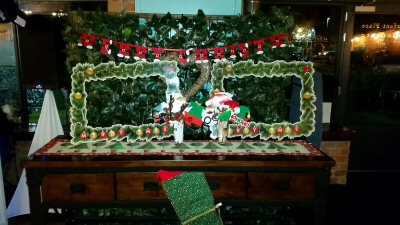 Carriages, Oswestry. 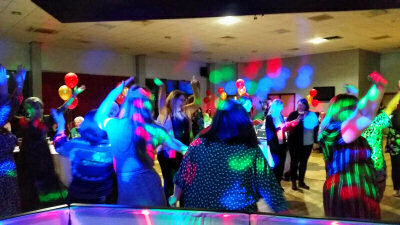 Courtney’s 21st Birthday Bash, Oswestry Rugby Club. 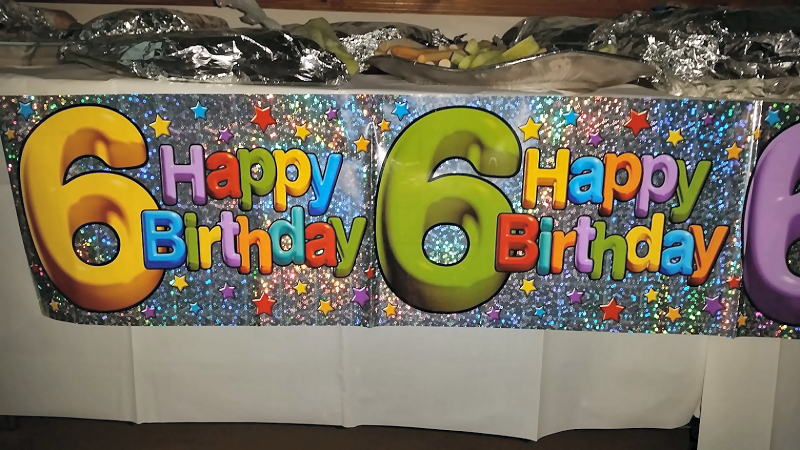 A number of Child Parties, 5th, Joint 6th, another 5th Birthday Party. 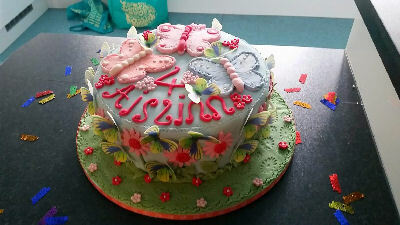 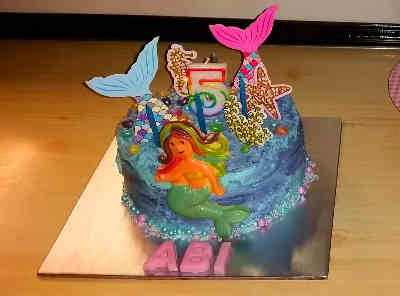 Check out Abi’s Birthday cake! 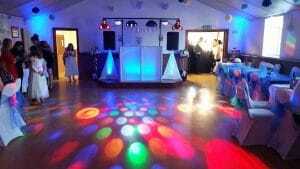 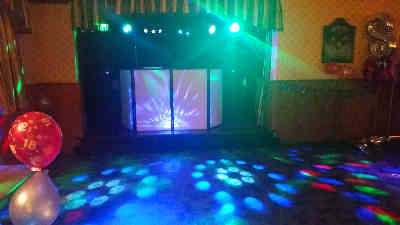 Also we had equipment on hire for a chilled 60th Birthday. 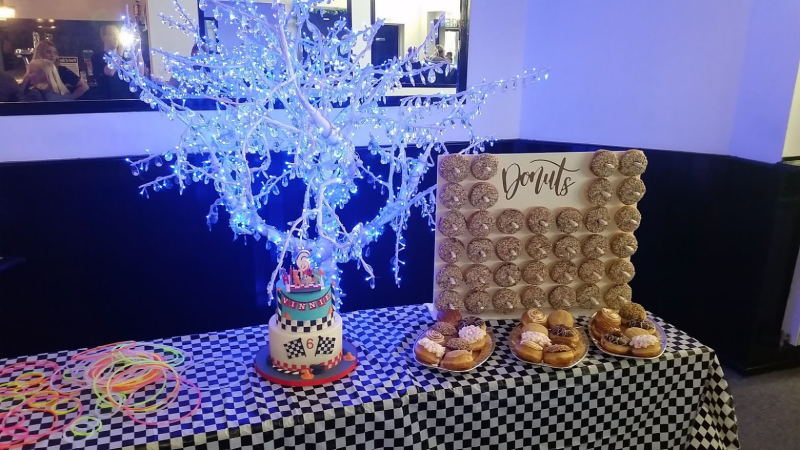 ‘Tis the season… for a party! 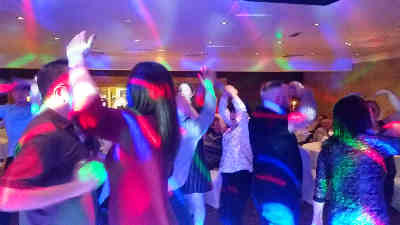 With Christmas, Birthday’s and New Years Eve on the horizon we had our hands full with party goers. 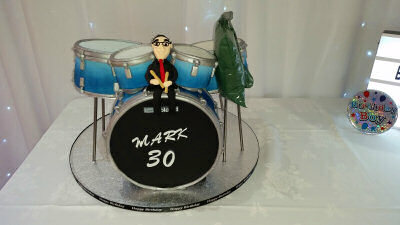 Marks Girlfriend went all out for his 30th Birthday and ordered our full lighting and backdrop packages. 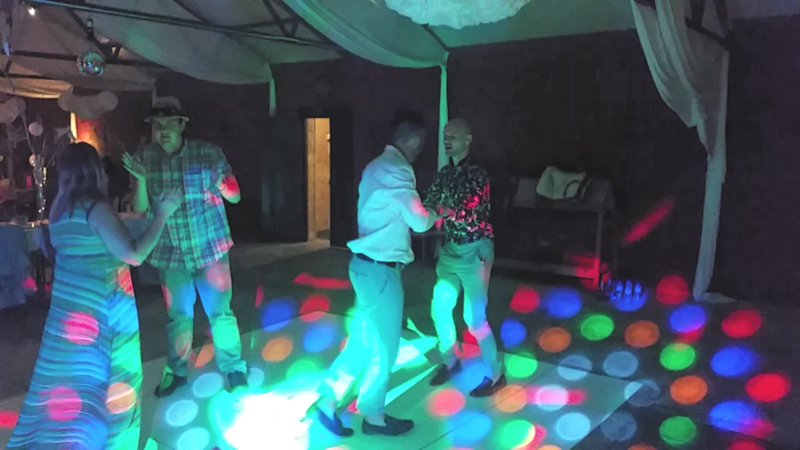 With a month full of ‘Office’ Christmas parties at our residency, There was plenty of turkey, music, dancing and some games! 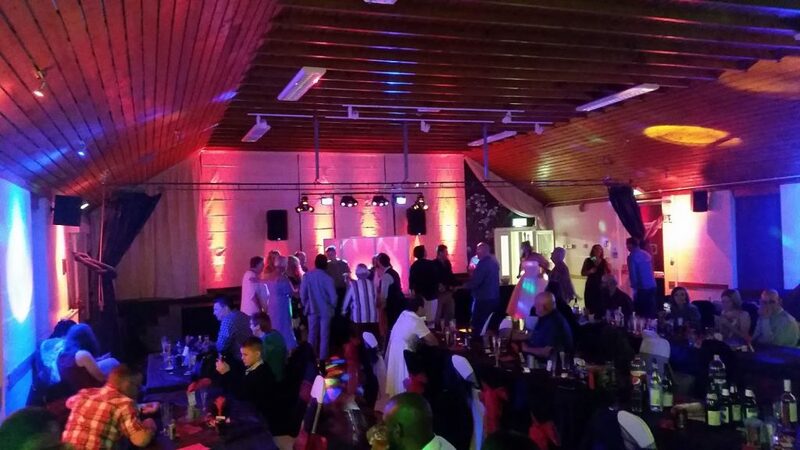 Amongst the celebrations we provided entertainment for: Sainsbury’s Oswestry, Border School of Gymnastics, RMT Servicing and Pickstocks Construction. 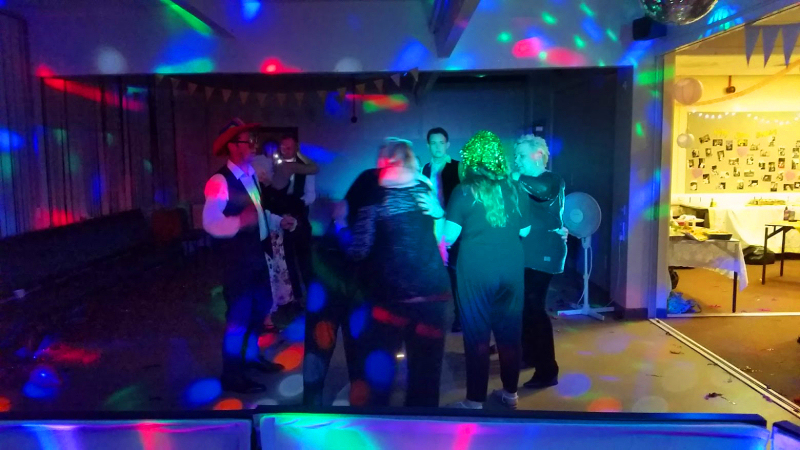 Fabulous decorations, Great turn out, Music, Dancing and Games… A fun time for all. 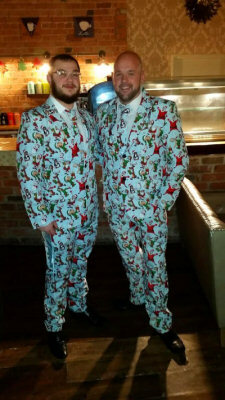 Photo’s of various nights in the run up to Christmas. 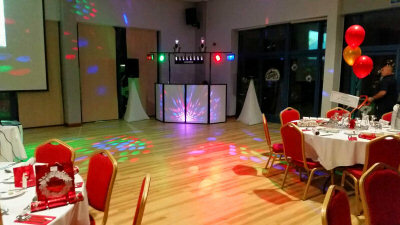 The British Ironwork Centre held their Christmas Party at The Venue, Park Hall. 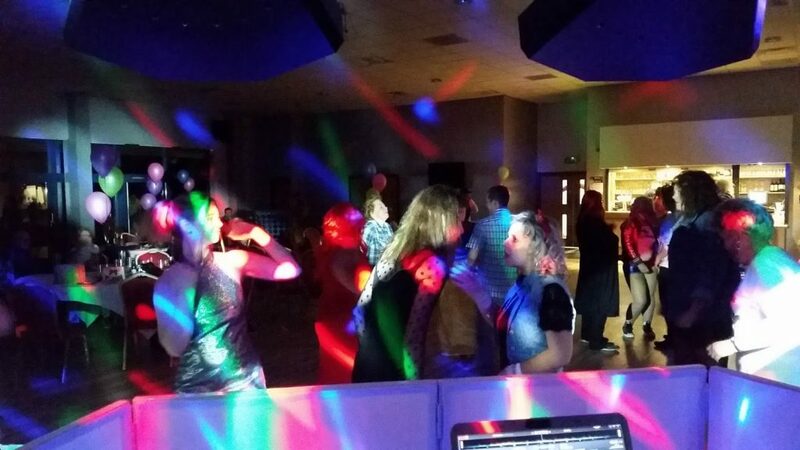 This was our FOURTH year of DJing for the British Ironwork Centre. 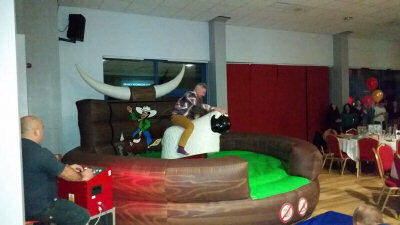 Food, Games, Entertainment and a Rodeo Sheep! 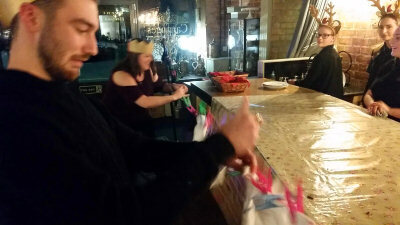 Celebrating in the new year at Carriages, We hosted a family friendly event. 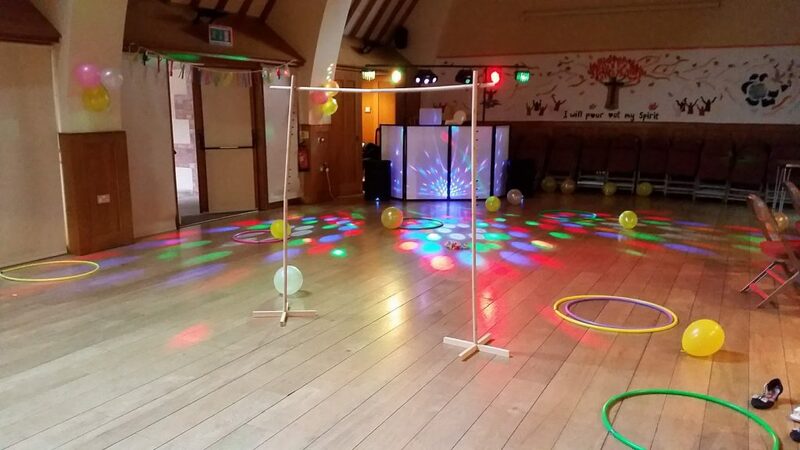 Fun and Games for all the family with access to the soft play fun-house. 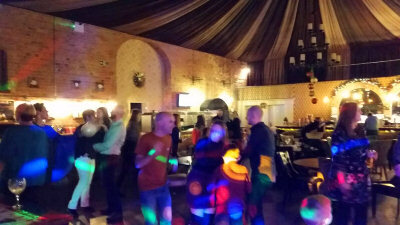 It was ideal for parents to bring the children and see in the new year as a family. 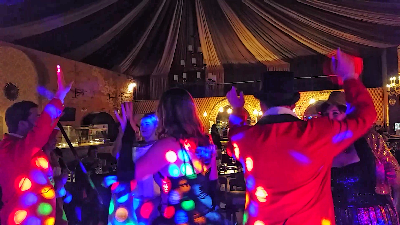 Dancing, Games, Drink and Party food… that’s how to bring in 2019! 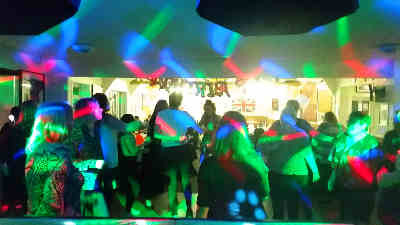 Winter eases its feet under the table and that brings cold, wet nights. 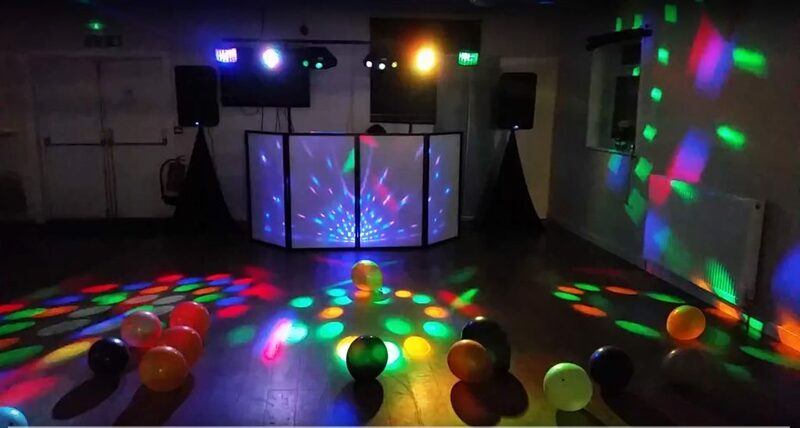 Undeniably this would dampen the spirits of most party goers, Nonetheless we have a gallery full of great party nights from November. 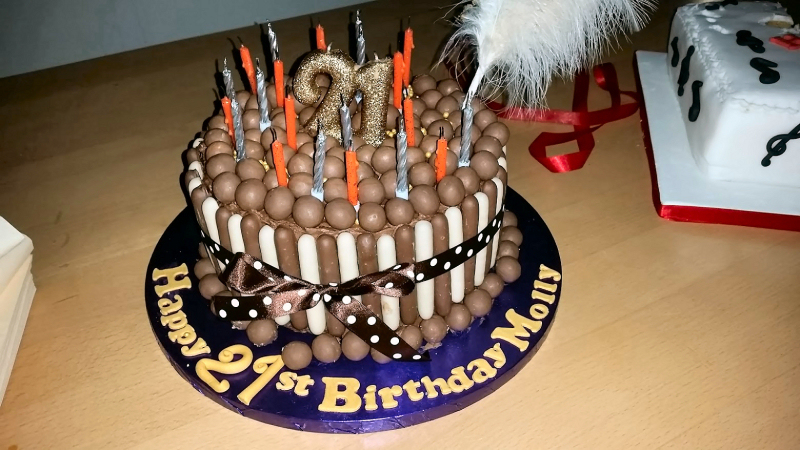 Jeoff and Molly celebrated their 70th and 21st Birthday’s together. 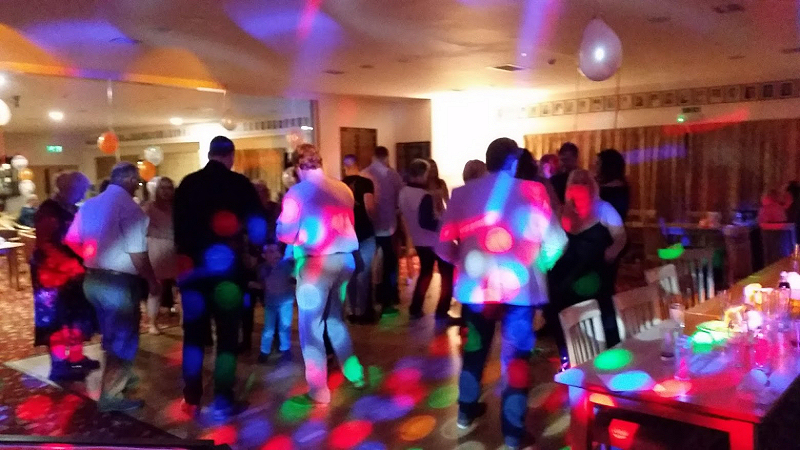 It was a touching family event with an extremely good turn out. 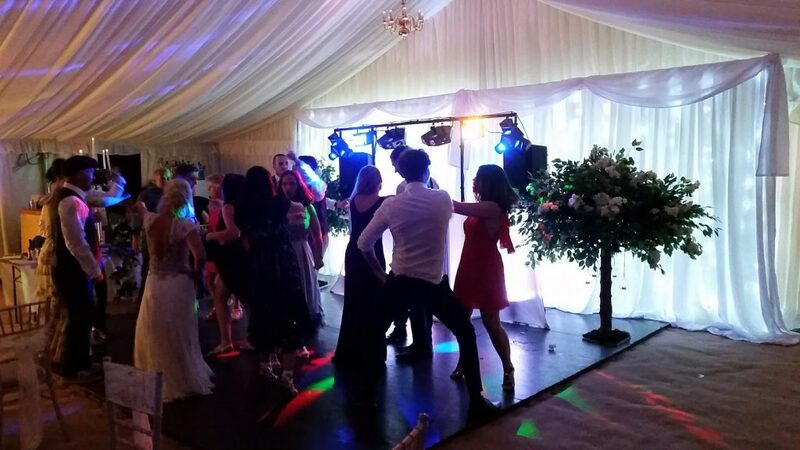 Entertaining over 70 guests with 2 diverse age demographics was refreshing, Consequently we covered a wide variety of music genre’s that night! 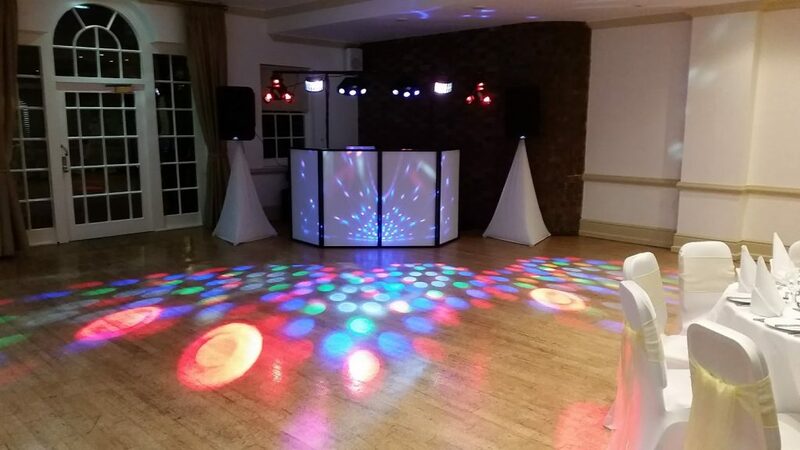 Location: Oswestry Golf Club, Oswestry. 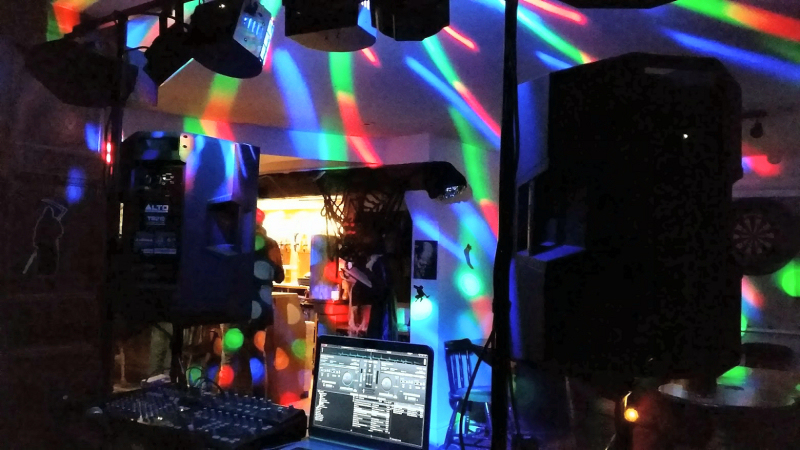 Mid Novermber and It’s time for our annual equipment electrical safety checks. 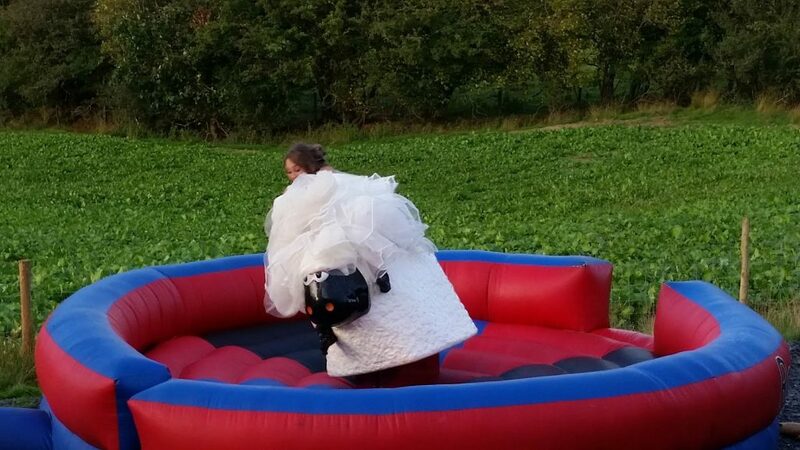 Also known as P.A.T testing. 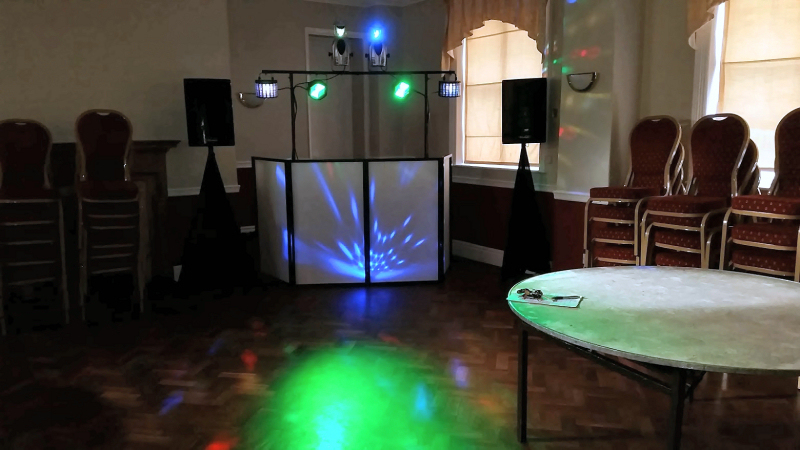 EVERY electrical item was tested, Speakers, Lights, Amplifiers, Mixers and all electrical power cables (Including extension leads). 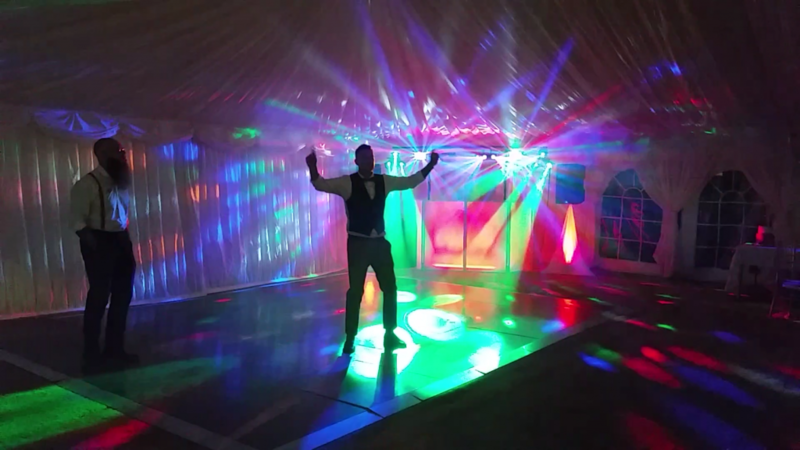 This was a very time consuming process with nearly 150 items to check. 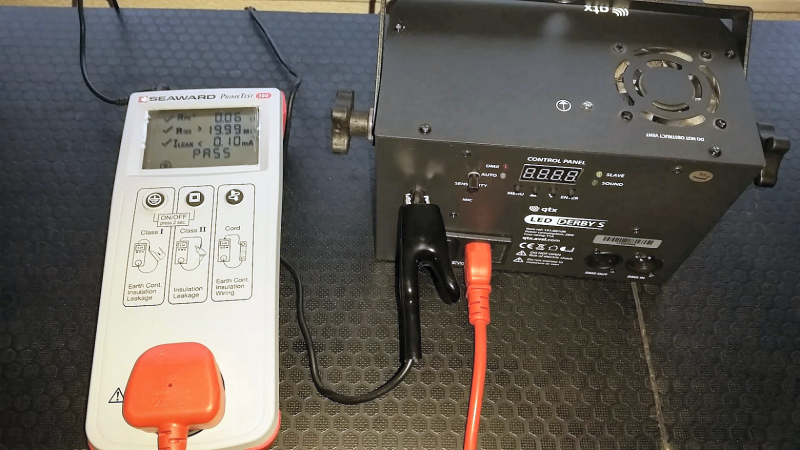 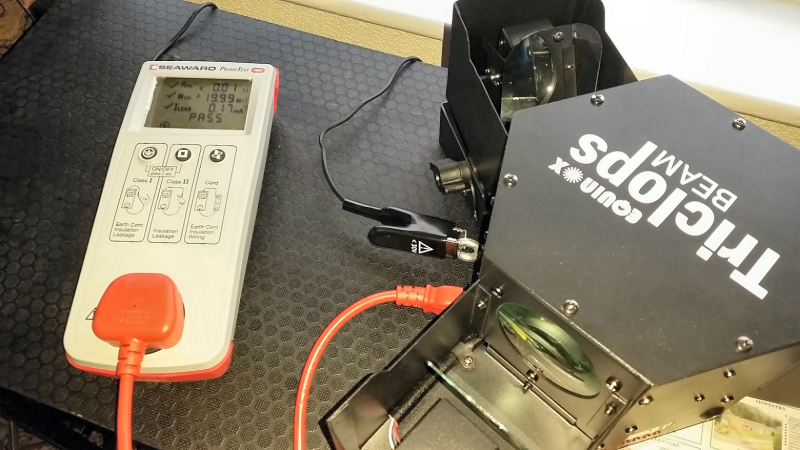 We believe in being open with regards to our safety tests so you can view the PAT testing report here. 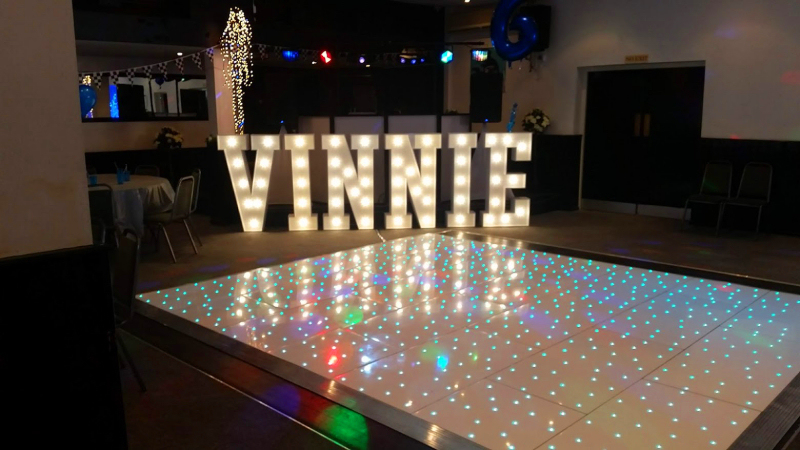 Vinnie’s 6th Birthday had the works, Aside from our interactive games and music, His parents laid on an LED dance floor and Light up lettering. 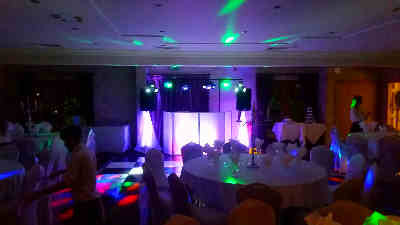 I guess its the perks of owning a venue dressing business: Uplit Event Hire. 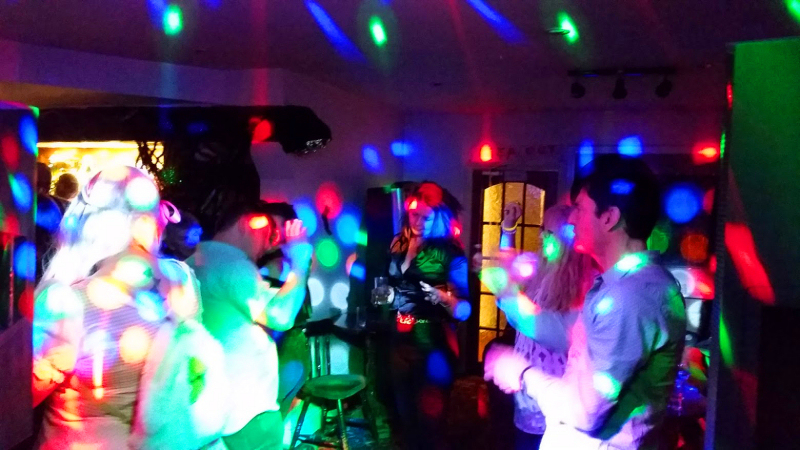 The Last Inn – Hengoed, Oswestry. 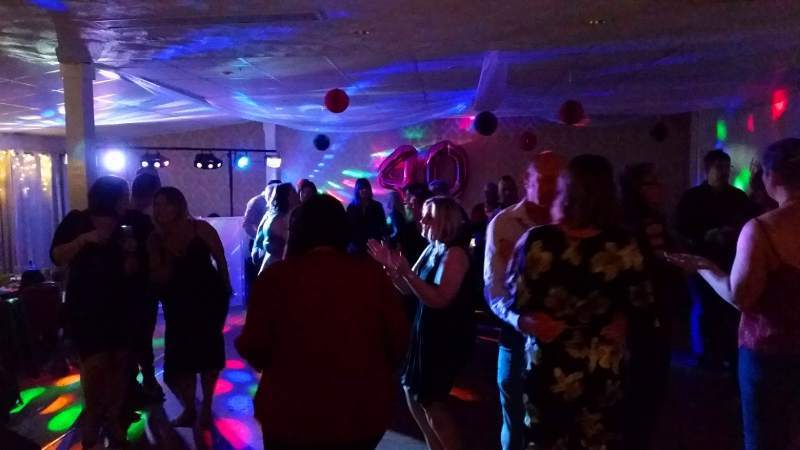 Louise’s 40th birthday bash was a very busy event, at one point the bar was 10 deep! 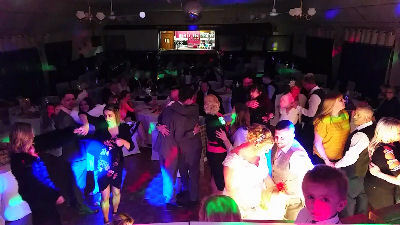 Nonetheless we filled the dance floor and it was a fantastic night. 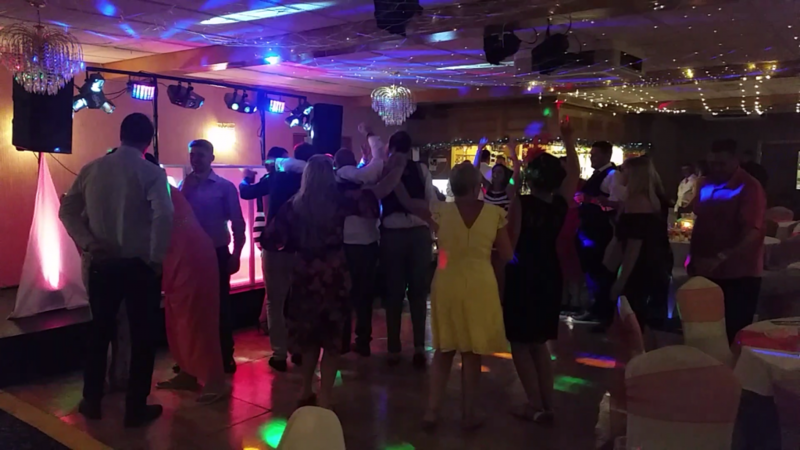 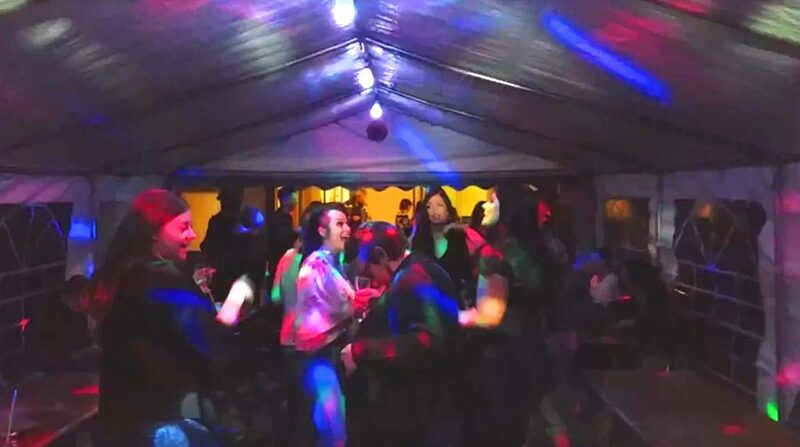 (If you have a facebook account you can view a video flashback of the night on our facebook page) Broseley Cricket Club, Broseley. 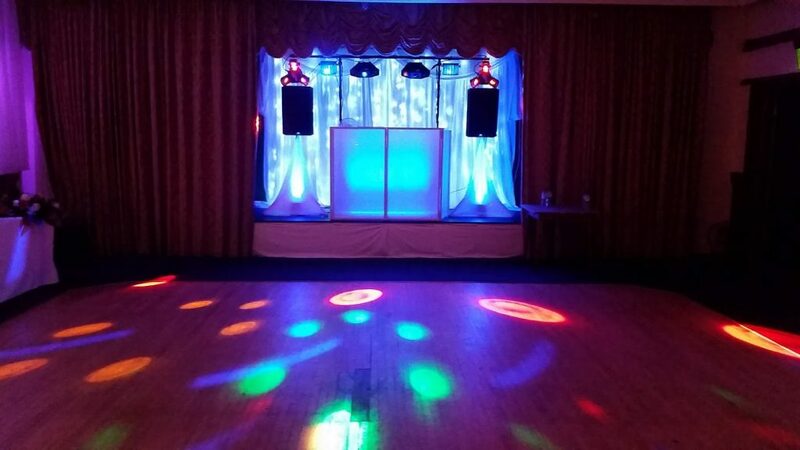 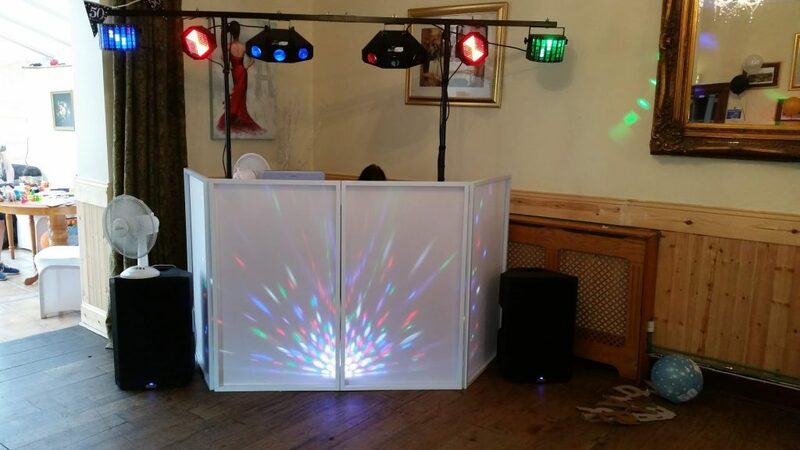 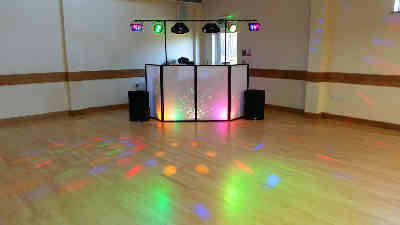 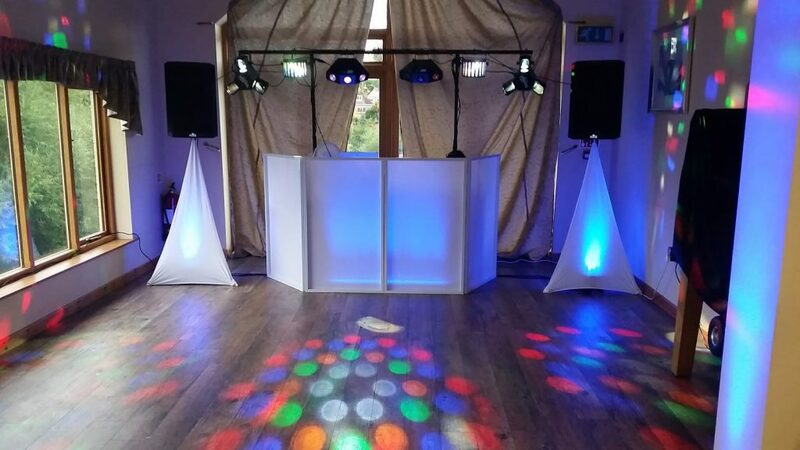 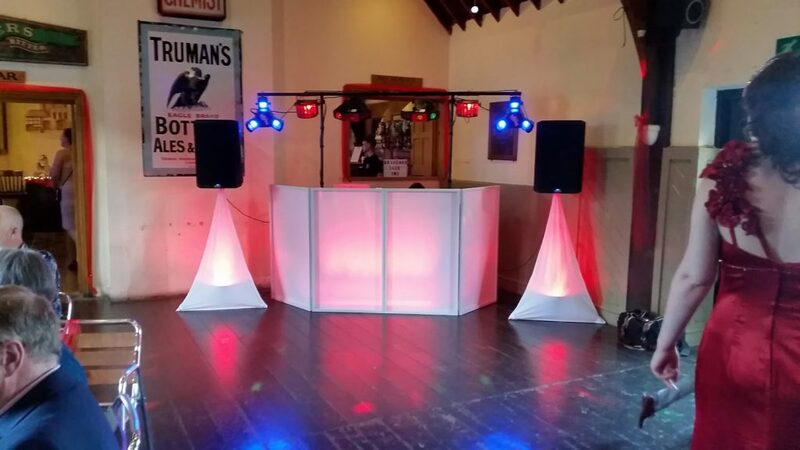 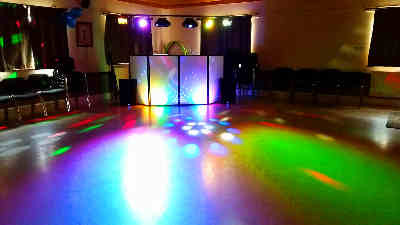 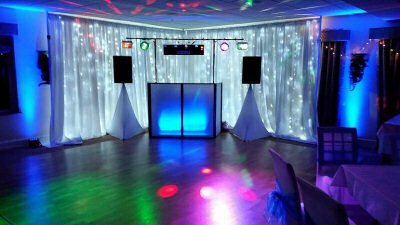 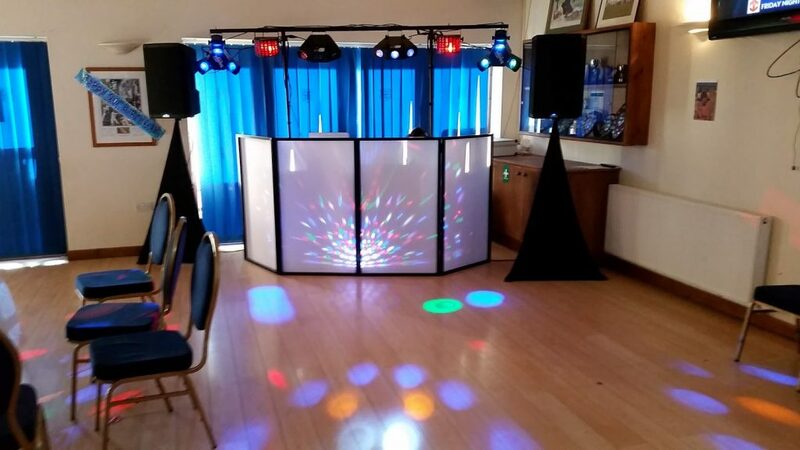 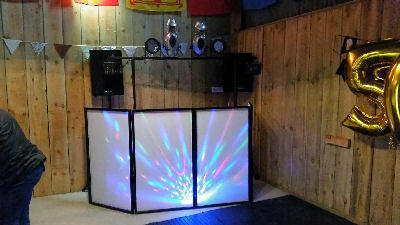 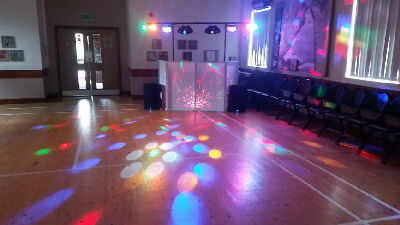 Our DJ-less Equipment was on hire again, Demonstrating this, it was out for an 80th Birthday in Llangollen. 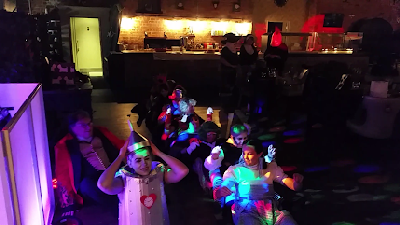 We started with 3 gorgeous weddings, various adult, teen and child birthday’s and ended with a number of Halloween parties! 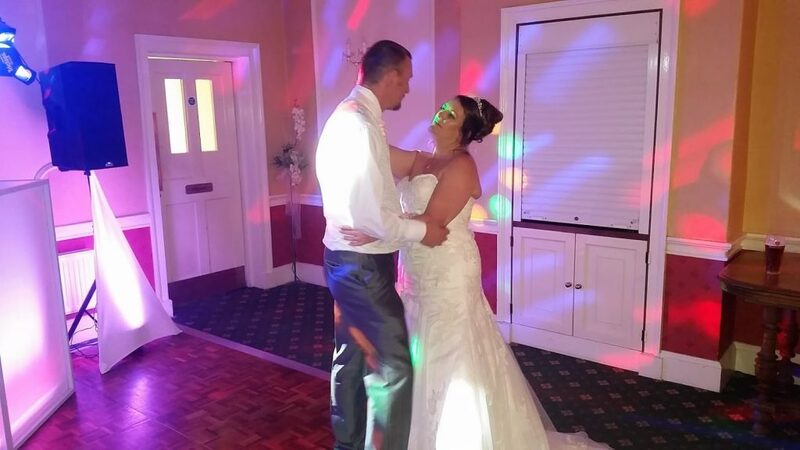 Starting October’s gallery blog with Mr and Mrs Colohan who got Married in Greece. 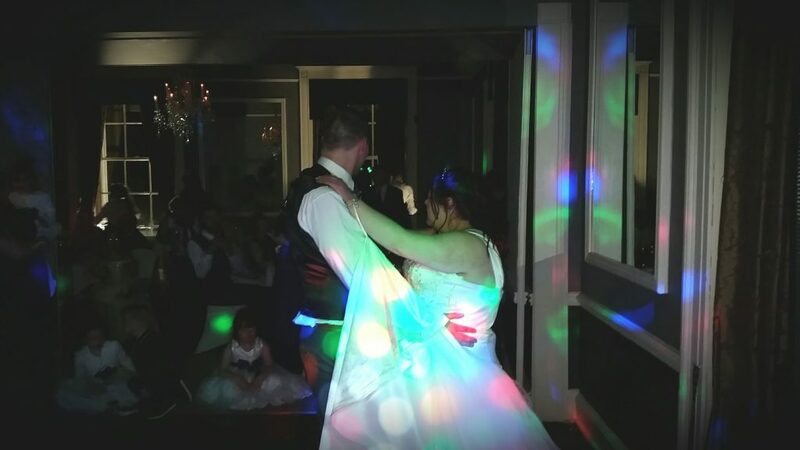 Instead of a first dance, we played their ceremony to the entire reception on the big screen! 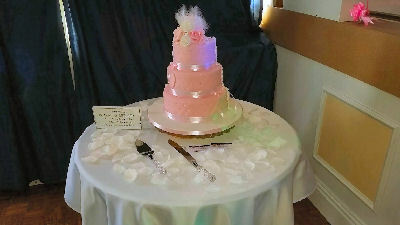 They both chose the fabulous HOT-PINK dressing, up-lighting and mood lighting. 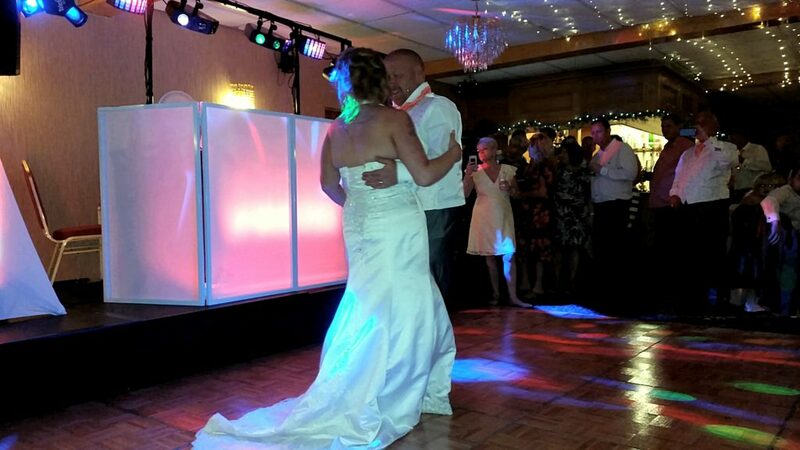 Newly Weds Mr and Mrs Jackson cutting their wedding cake and leading into the first dance. 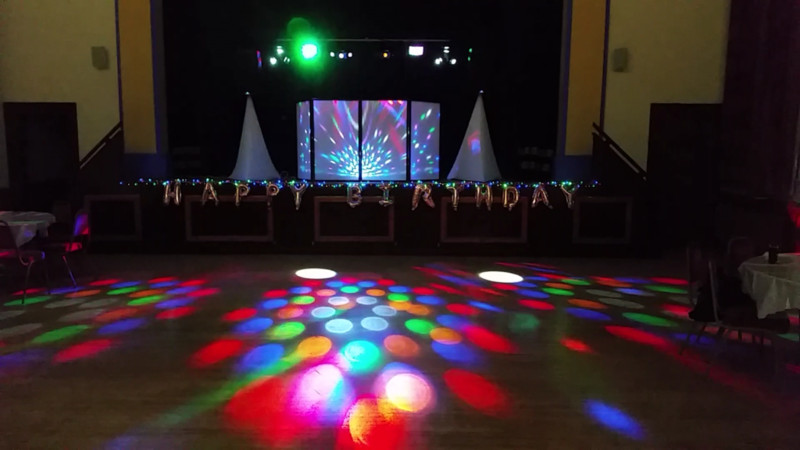 Sweeney Hall, Oswestry. 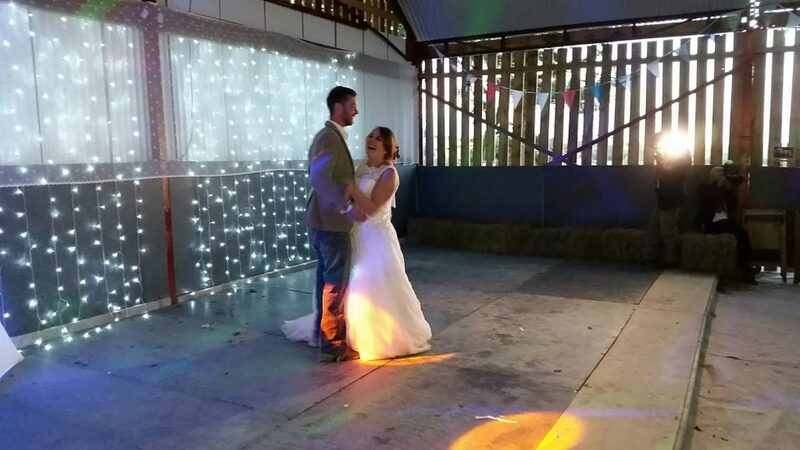 Mr and Mrs Gibson celebrated their Autumnal wedding just before Halloween. 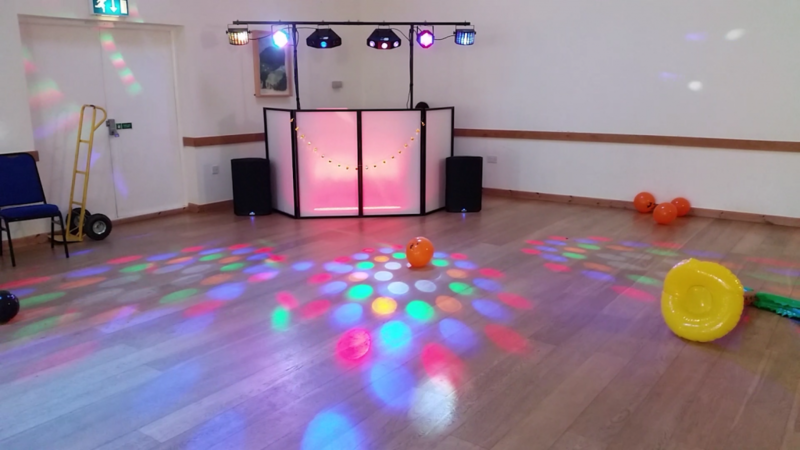 Autumnal orange colour theme and when it came to the party, WE RAN OUT OF DANCE FLOOR! 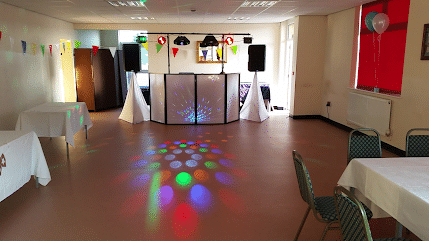 Yes you read that right… we ran out of dance floor! 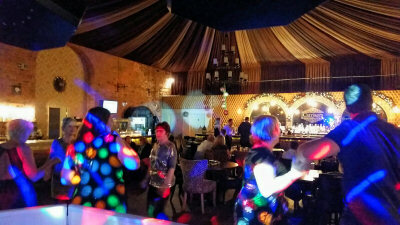 Location: Carriages, Oswestry. 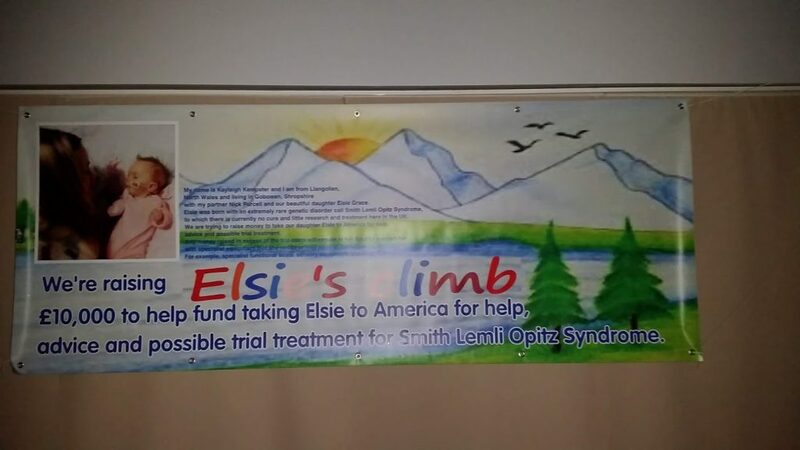 We provided a disco fundraiser to send little Elsie to america for treatment of Smith Lemli Optiz Sundromez. 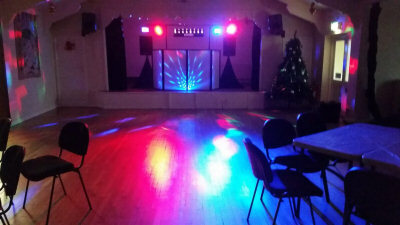 The Venue at Park Hall, Oswestry. 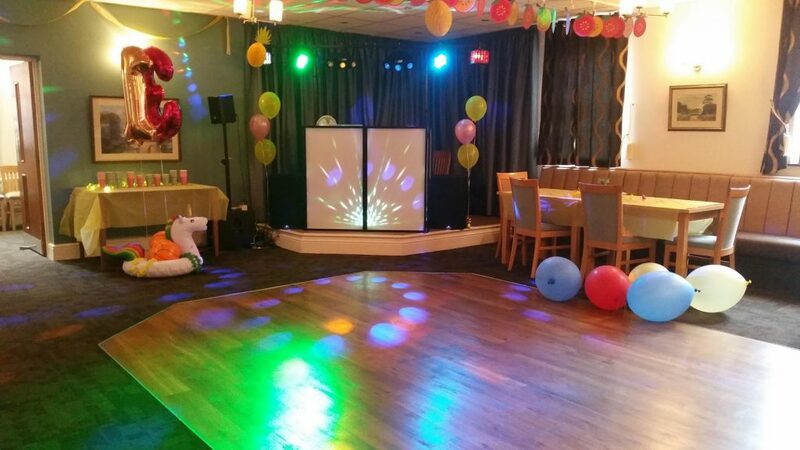 Child Parties and Adult Birthday Parties. 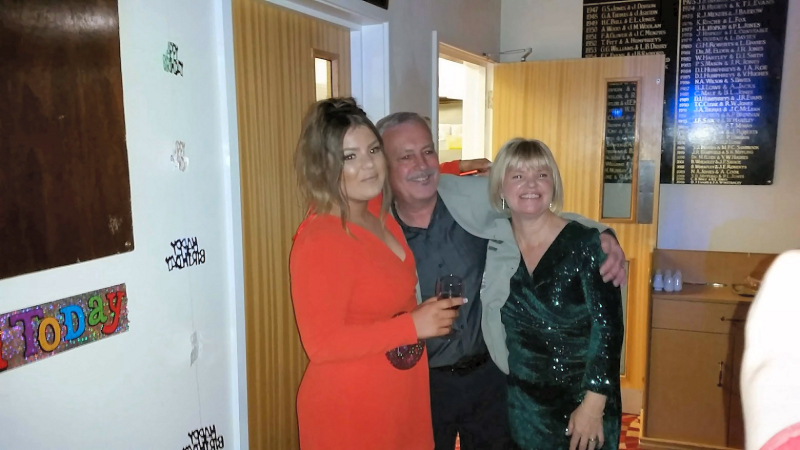 We do love variety in our gallery! 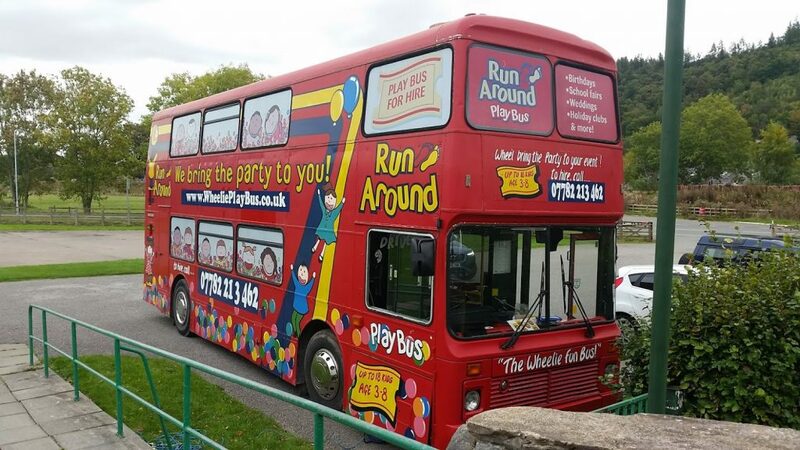 5th Birthday Party, Playbus, Party Games… fun for all. 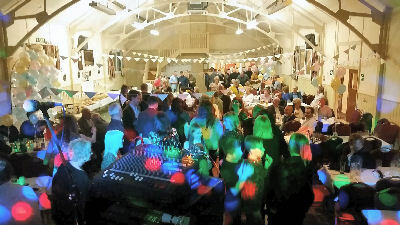 Corwen Pavillion, Corwen. 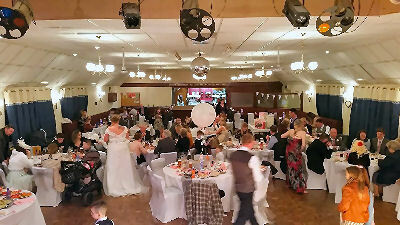 Wedding Reception of Mr and Mrs Templeton. 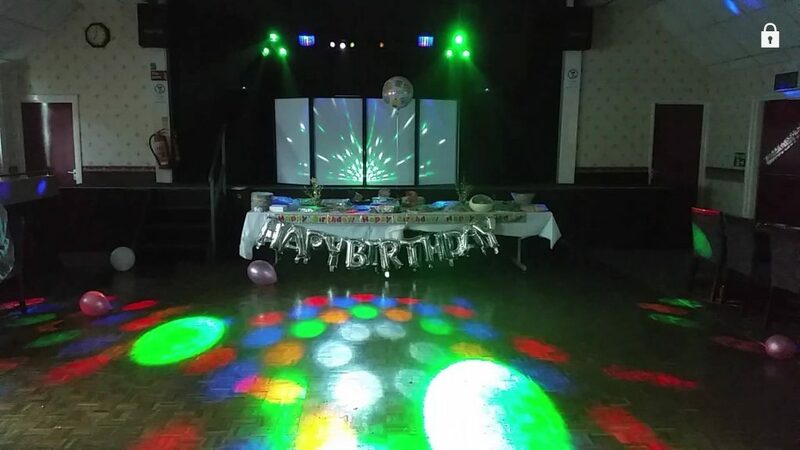 Red Uplighting on back wall. 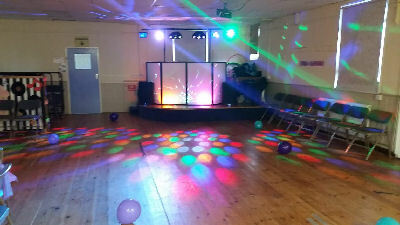 Arddleen Village Hall, Llanymynech. 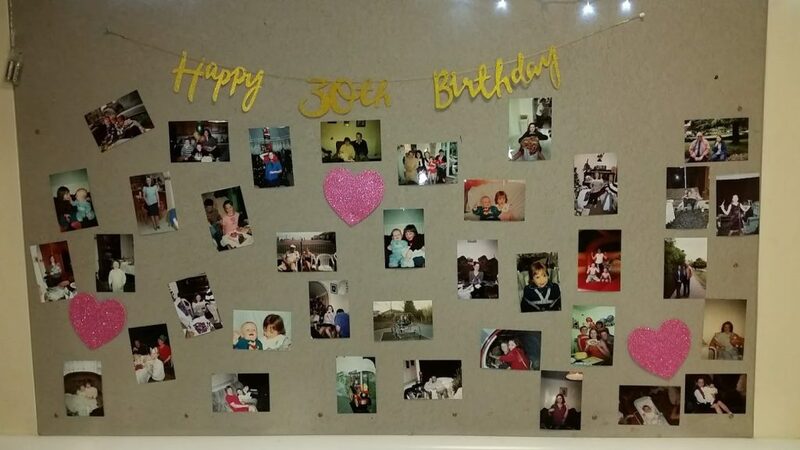 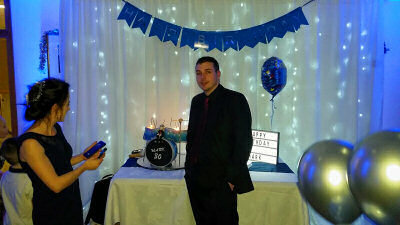 30th Birthday at The Venue, Park Hall, Oswestry. 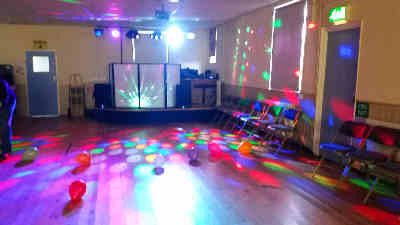 Child Party, Ludlow Football Stadium. 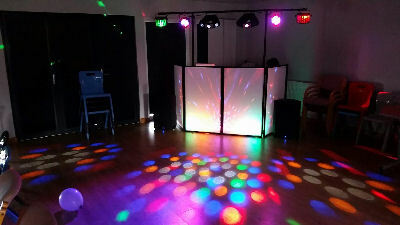 Photos provided and used with permission of Parent. 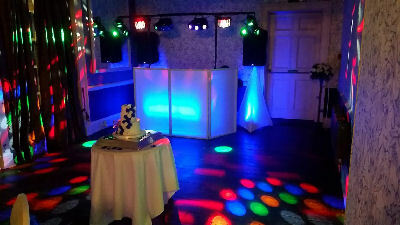 Gorgeous Reception for Mr and Mrs Jones, Carriages, Oswestry. 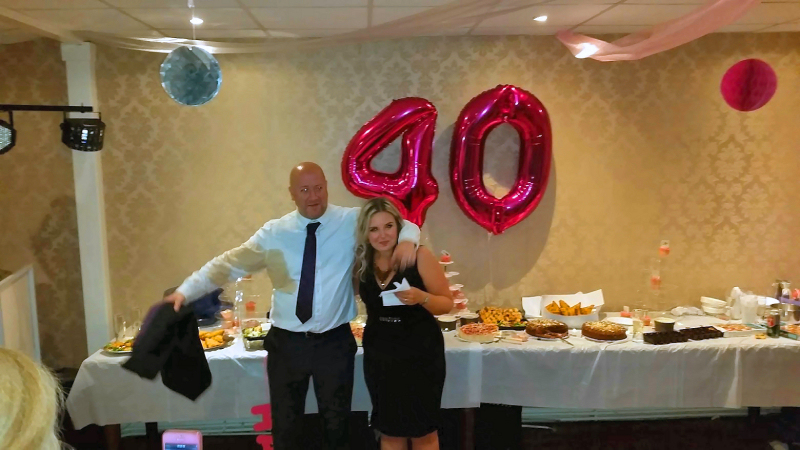 A Christening, A Staff Reward Night and a Cancer Charity Fundraiser. 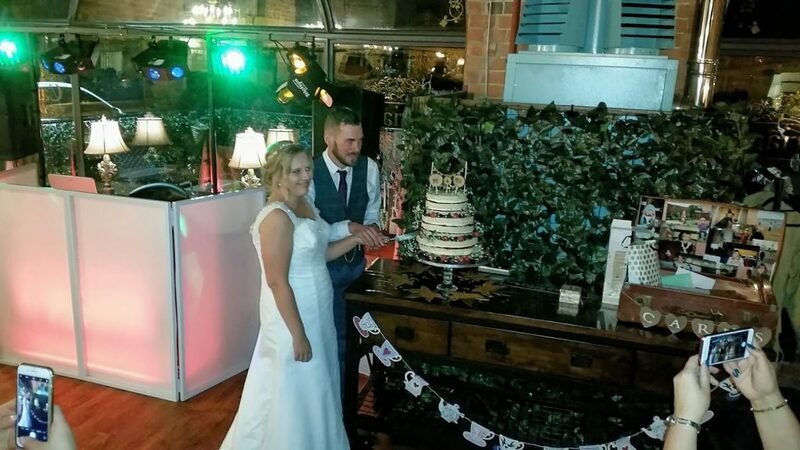 Mr and Mrs Griffths-Sergent’s Wedding in Leominster. 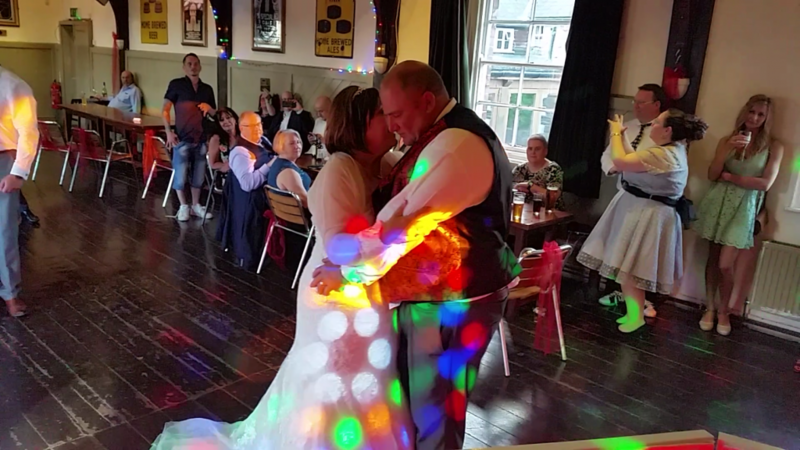 Mr and Mrs Livesey celebrate their marriage at the Elephant and Castle, Newtown. 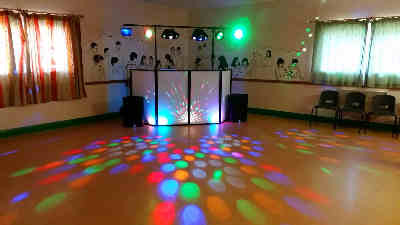 Standard Equipment Hire for a chilled 60th Birthday Sweet 16th Birthday celebration. 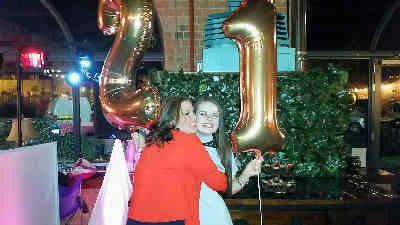 for Caitlin. 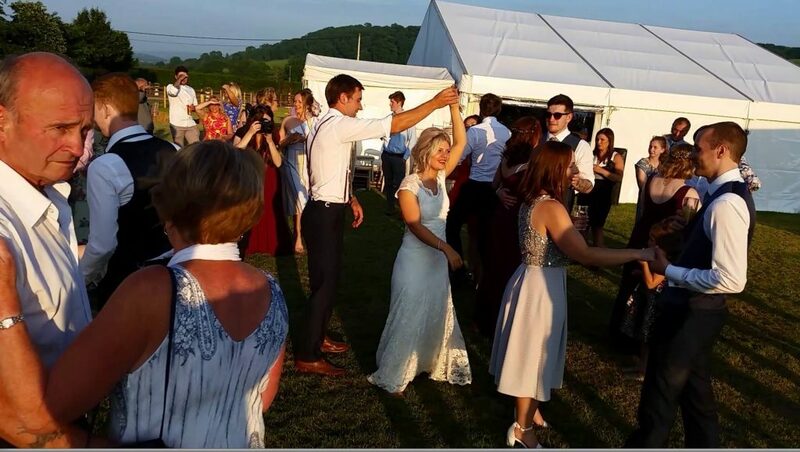 The relentless sunshine was fantastic for evening events. 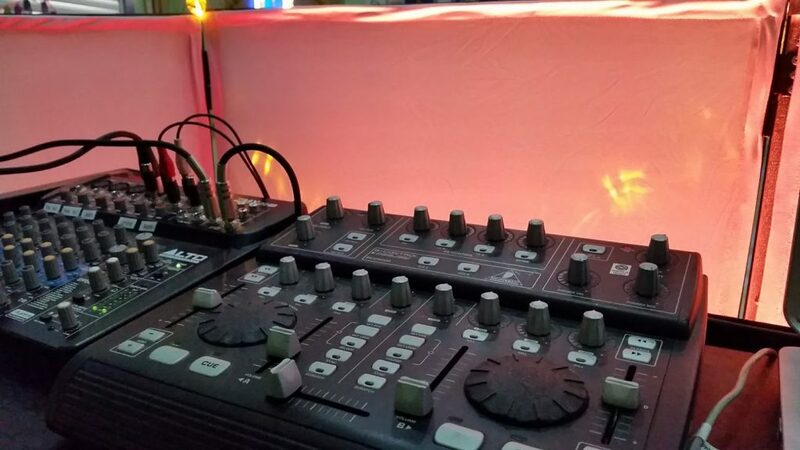 A tad warm at some venues but we came prepared with desktop fans to keep us cool when DJing. 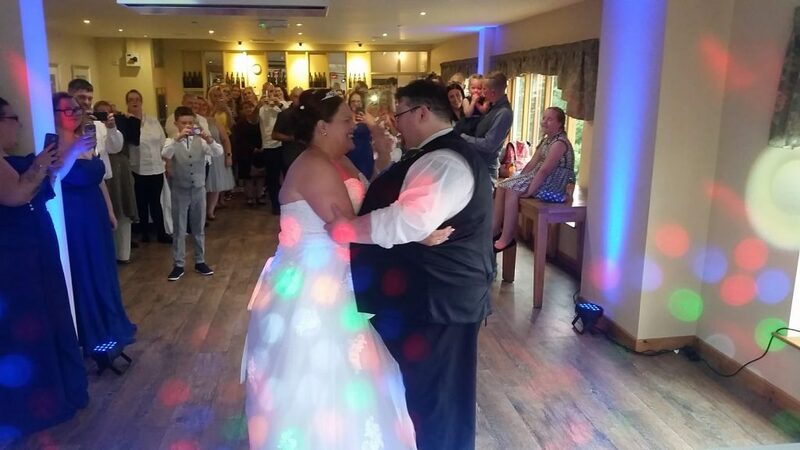 July brought more fabulous weddings as well as our first Civil Ceremony for 2018. 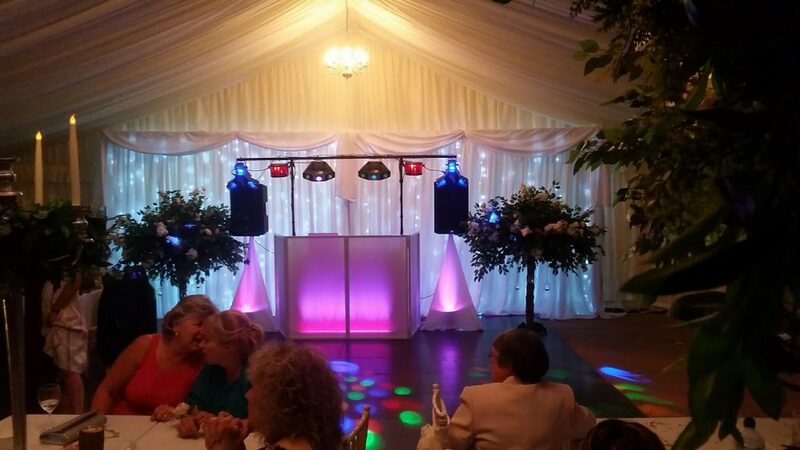 Purple Uplighting provided the WOW factor at one wedding while using our Hazer machine in a Marquee provided an impressive light show. 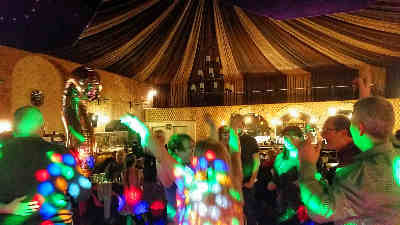 The next photo in our gallery was taken in panoramic mode. 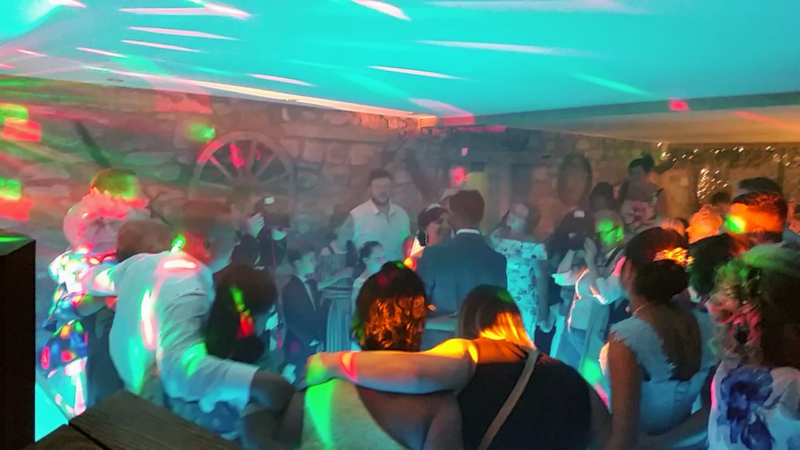 If you would like to see it in 360 pan Mode, view the post on facebook. 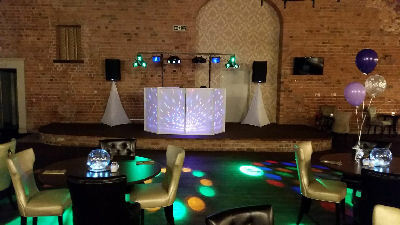 Above: Phil and Lisa’s Wedding – Henlle Park Golf Club. 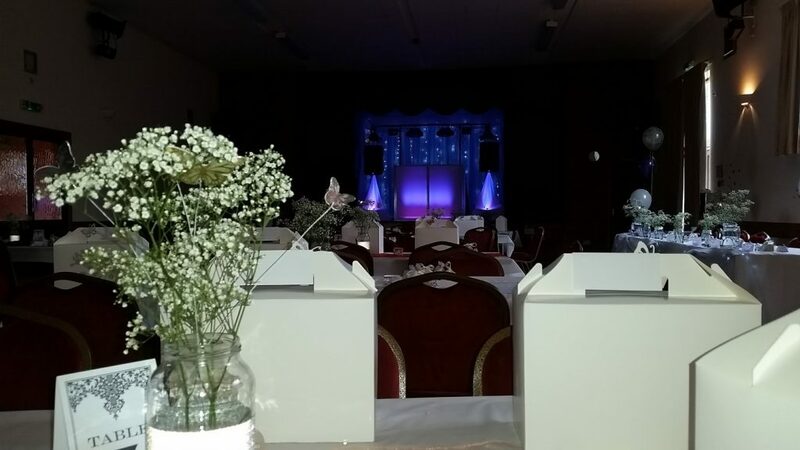 Our Purple Colour-wash and Uplighting compliments the Cadbury Purple Chair sashes and Table runners. 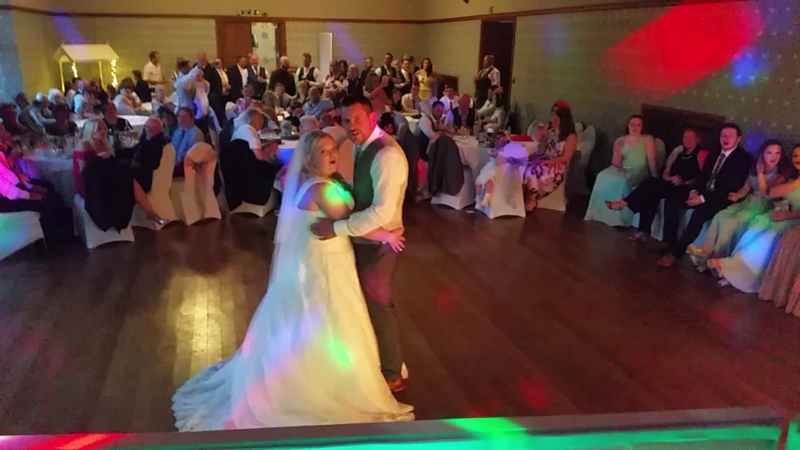 Micheal and Daisy’s Wedding – Garthmyll Hall, Welshpool. 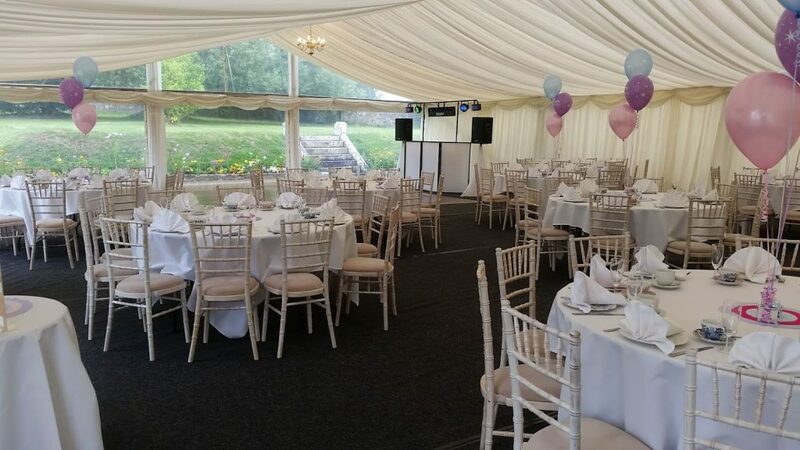 Fabulous Marquee Wedding. 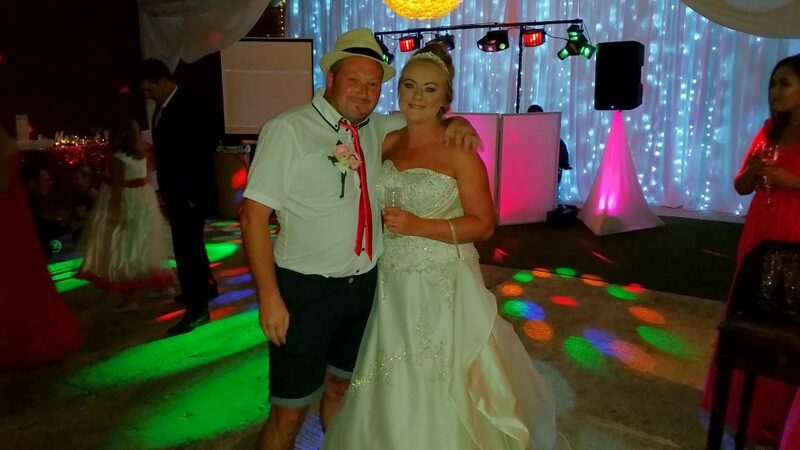 Mark and Steve Latham-White Civil Ceremony – Bromwhich Park Farm, Oswestry. 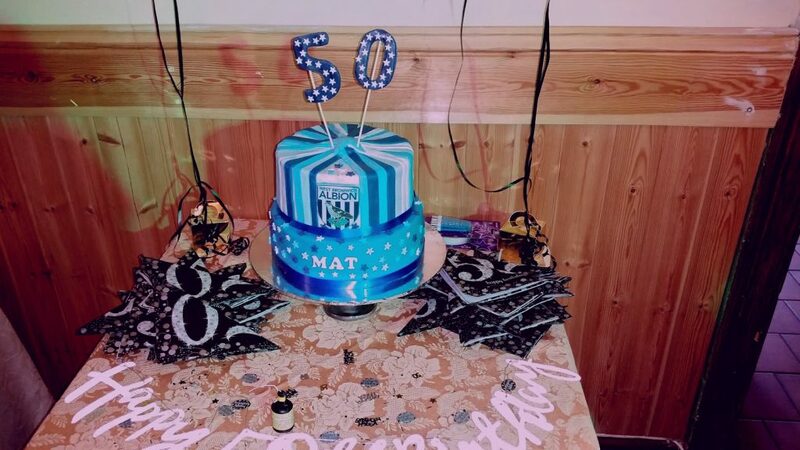 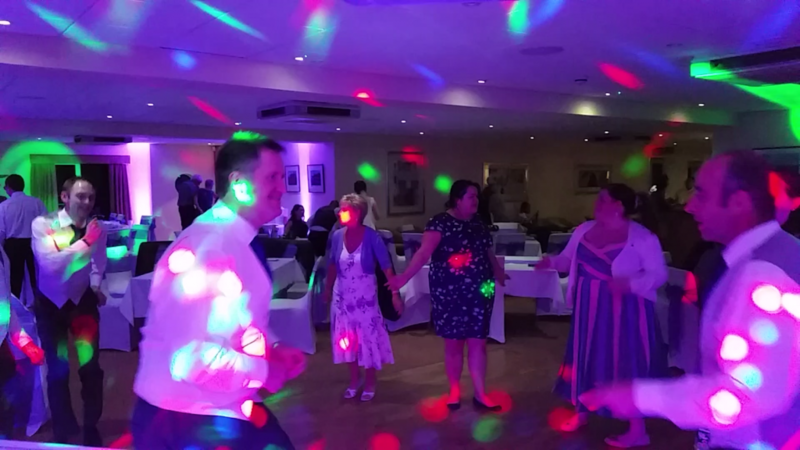 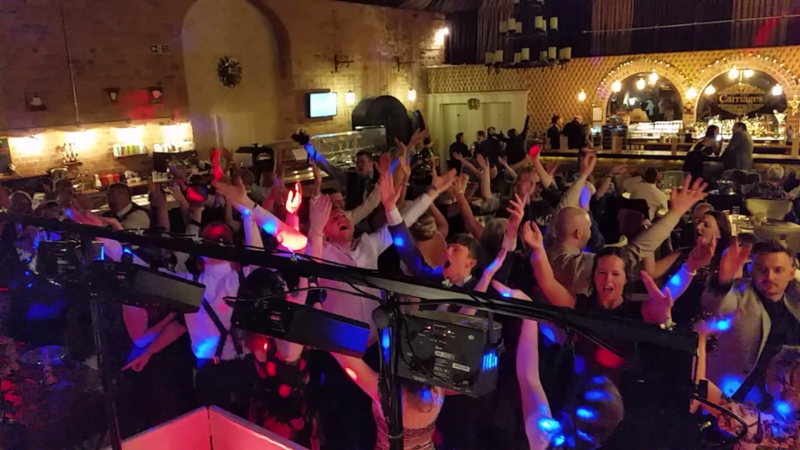 Matt’s 50th Birthday Party – The Lion Hotel, Brosley. 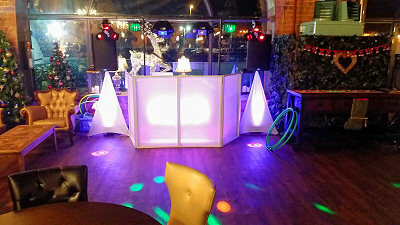 The snow of February and March is all but a distant memory and the summer sun is shinning strong late into the evenings. 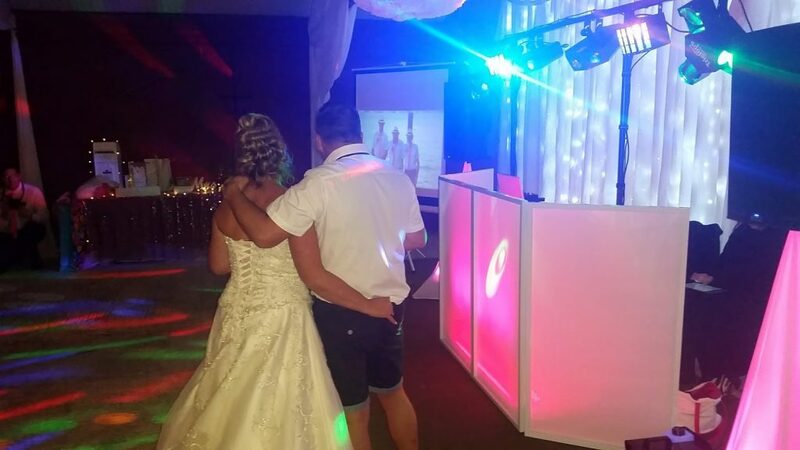 With that in mind, the scene is set for a perfect outdoor wedding. 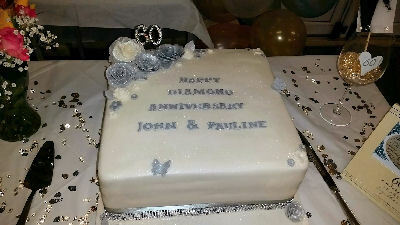 One lovely couple Sophie and Jedd did exactly that! 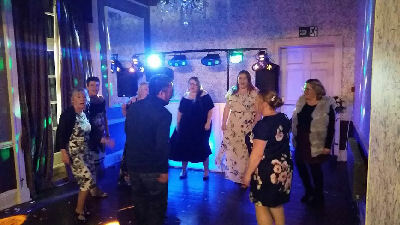 Other notable events include a cancer charity event hosted by the fabulous staff of Debenhams, Wrexham where we provided music and compared the fashion show! 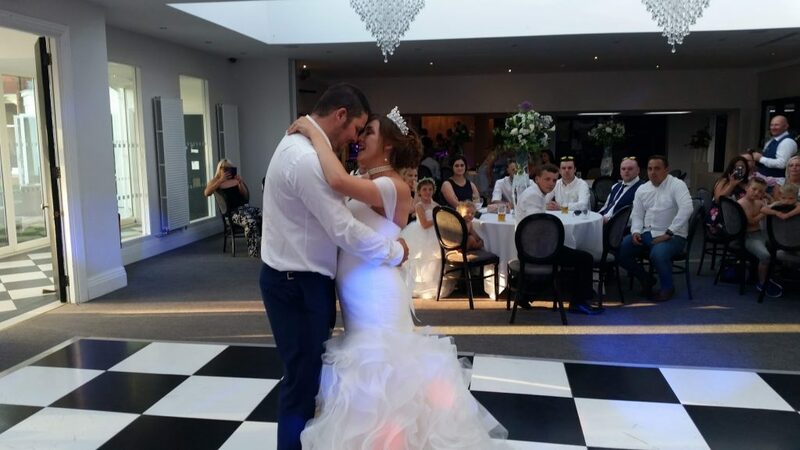 Kick starting June’s gallery blog is Connah and Zoee’s wedding. 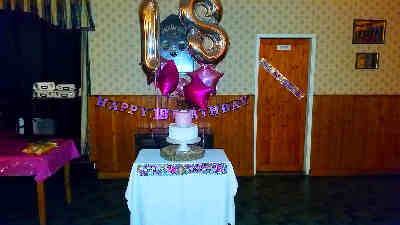 Zoee chose a purple colour-wash with 2 up lighter’s. 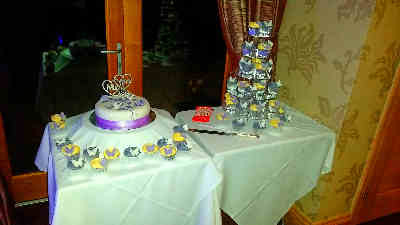 Its always difficult to photograph purple, it usually looks pink… but even so i think you can agree it looks beautiful. 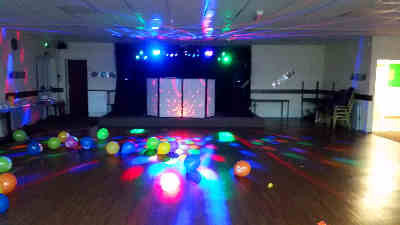 Tern Hill Hall, Market Drayton. 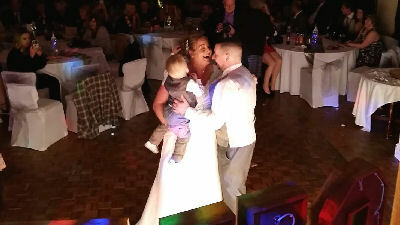 Sophie and Jedd’s Wedding. 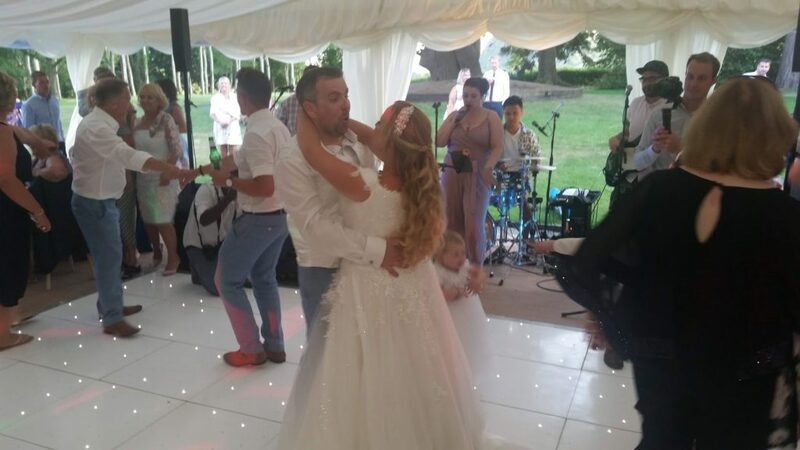 We love a Marquee wedding even more so when Sophie asked to have her first dance outside! 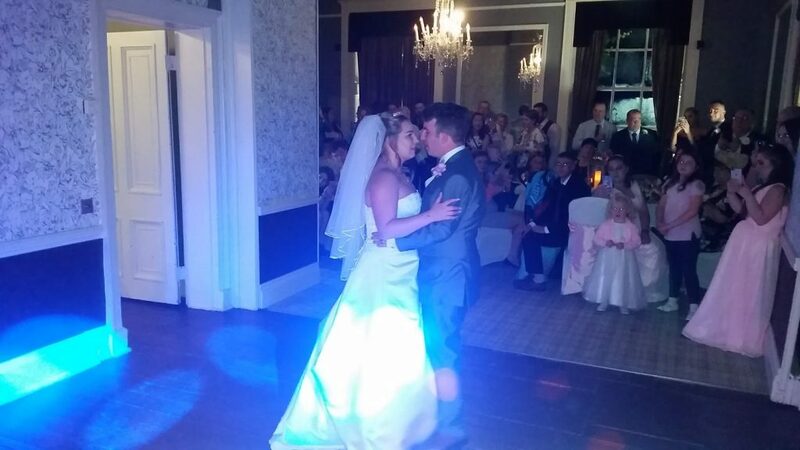 First Dance. 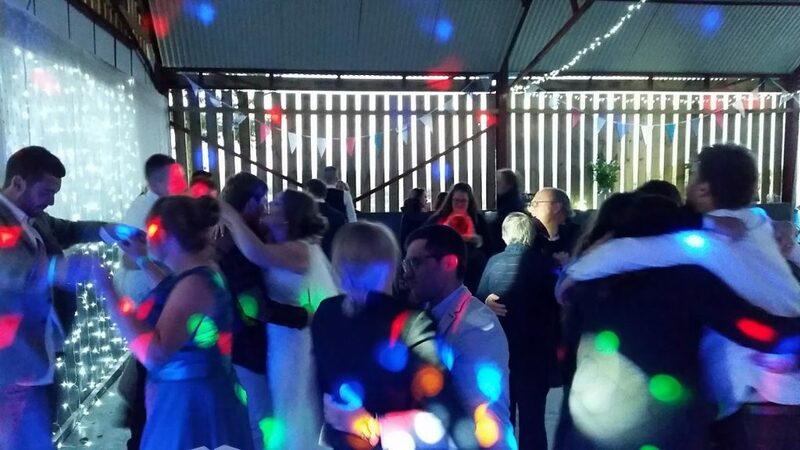 We undertook the logistics of getting extra speakers outside the marquee for their first dance as the sun set. 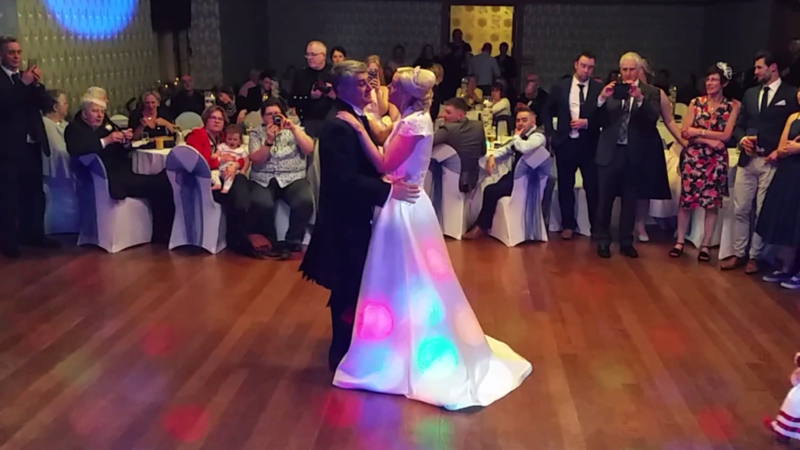 View video highlights of this gorgeous wedding. 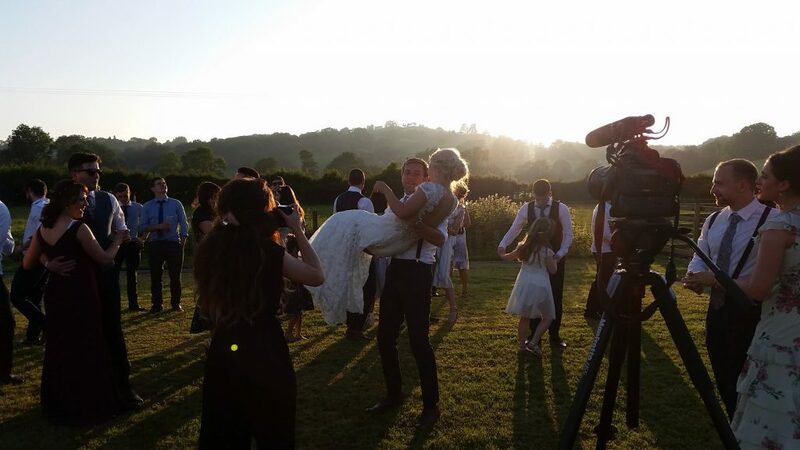 Jake and Ellie’s Wedding. 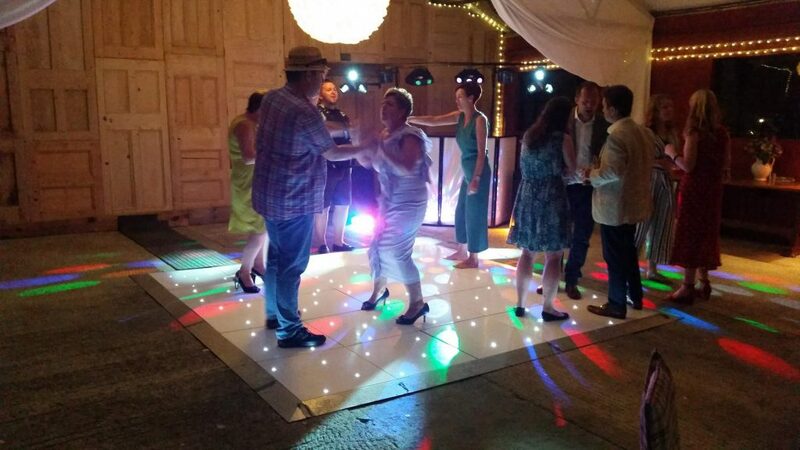 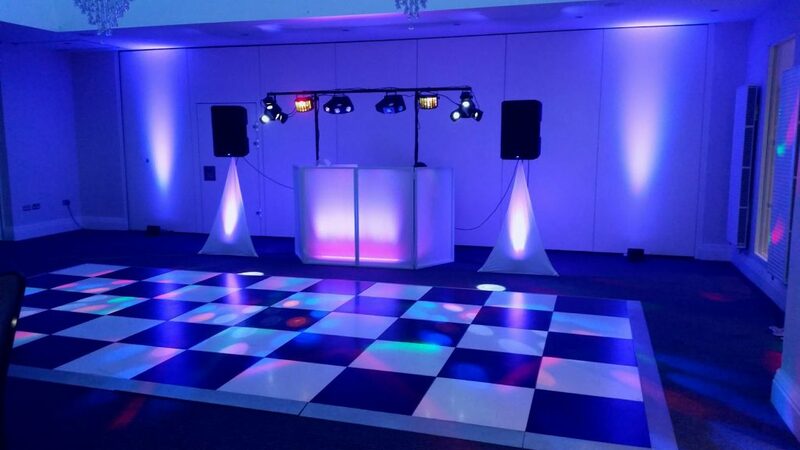 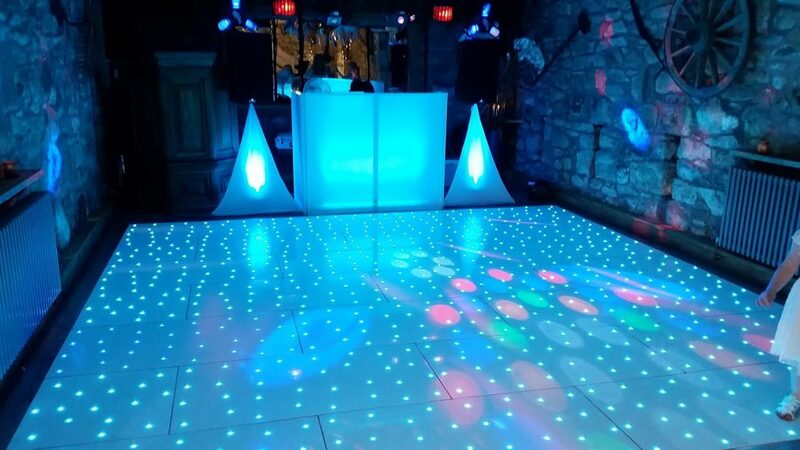 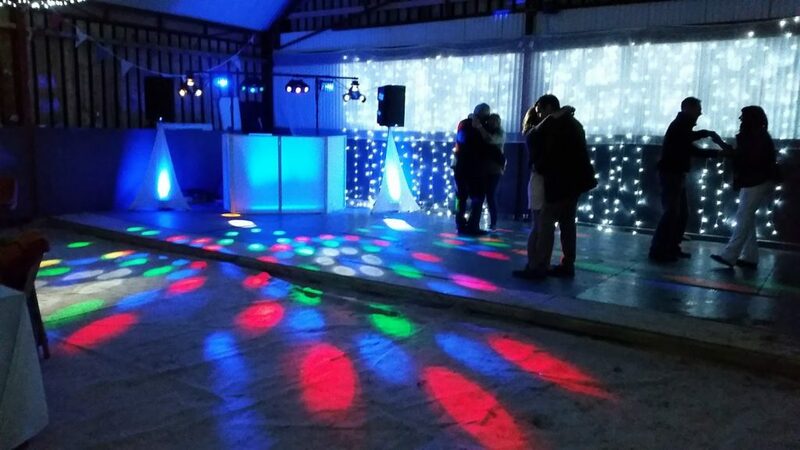 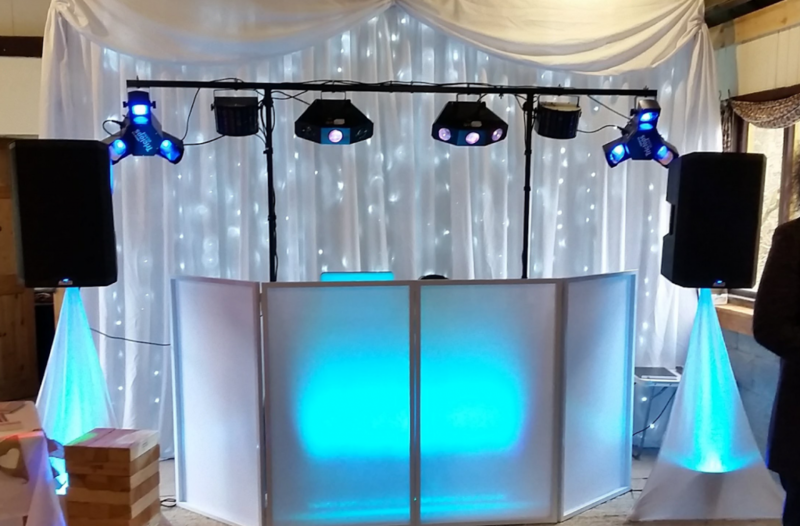 This lovely couple chose a Blue Colour-wash service which worked well with their hired LED dance floor and Tree. 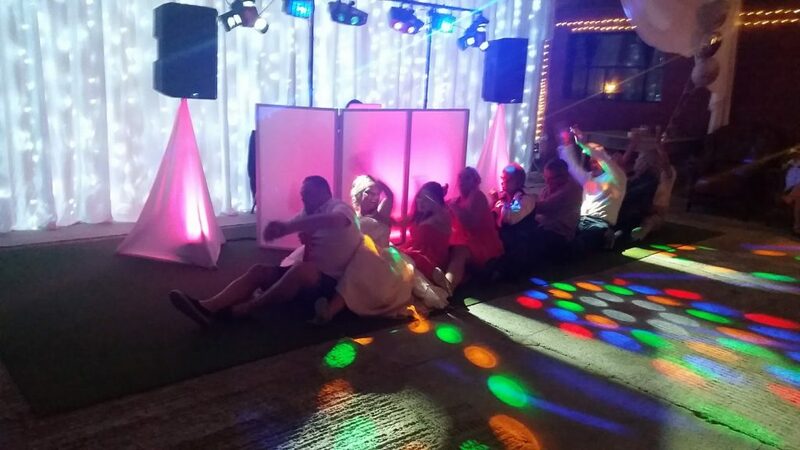 Carriages, Oswestry. 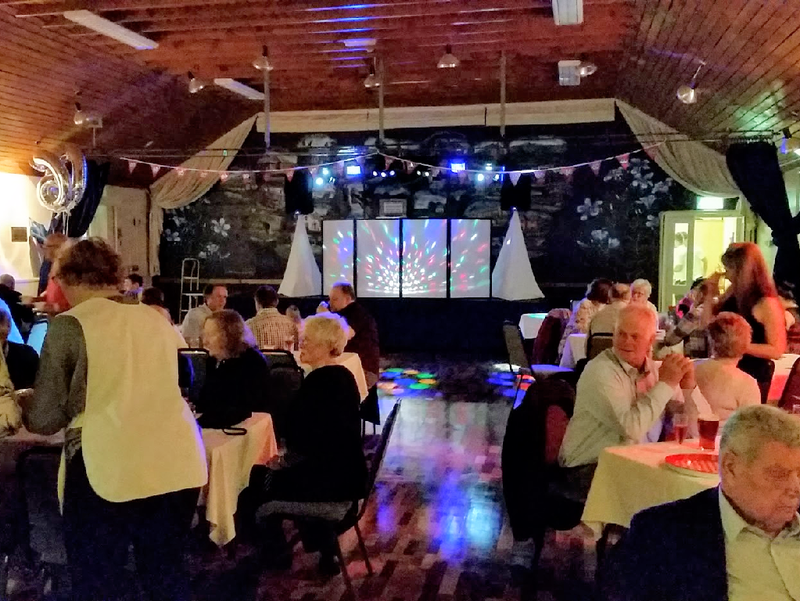 Penny’s supprise 63rd Birthday – Commrades Club, Ellsemere. 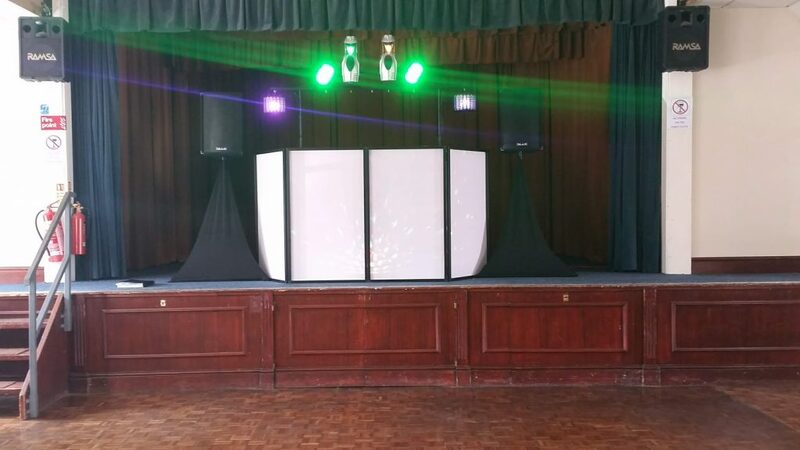 Oswestry School Prom. 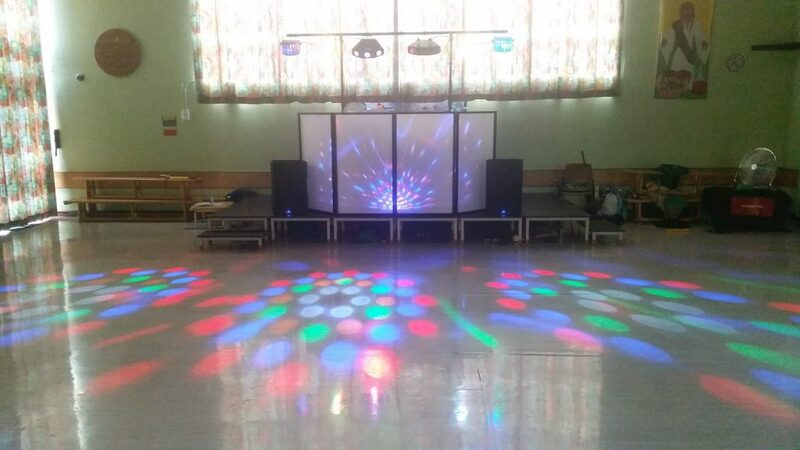 Only an equipment pic as the school leavers are 16. 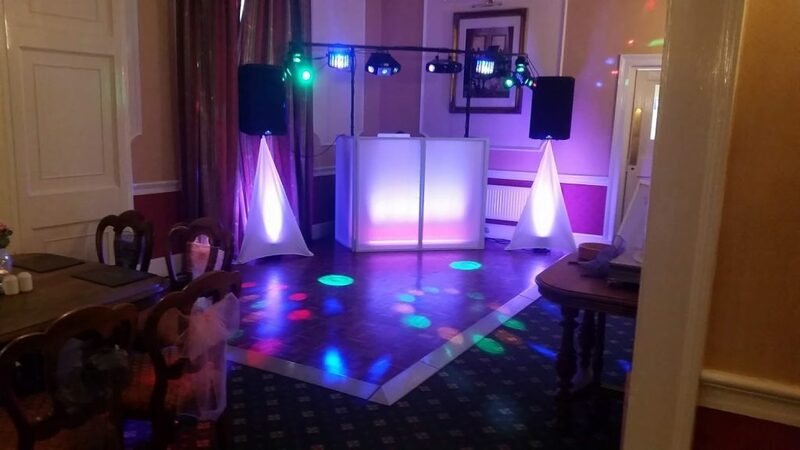 Sweeney Hall Country Hotel, Oswestry. 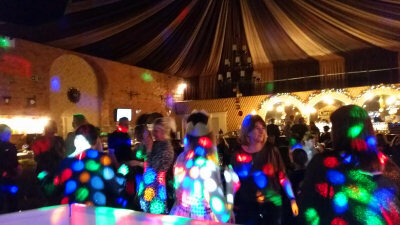 Aria’s 10th Birthday Party (Complete with Limbo) – Trinity Church Centre, Shrewsbury. 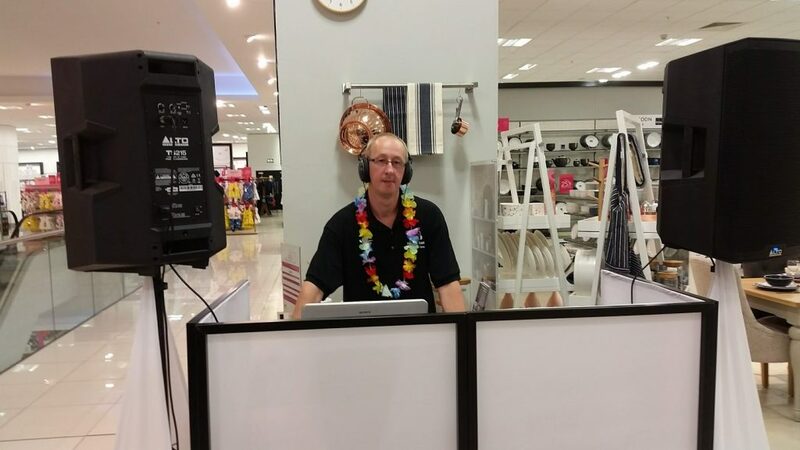 Look Good, Feel Better Fundraiser – Debenhams Wrexham. 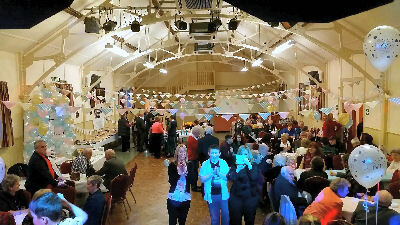 Above: Florrie’s 5th Birthday – Weston Rhyn Community Hall, Oswestry. 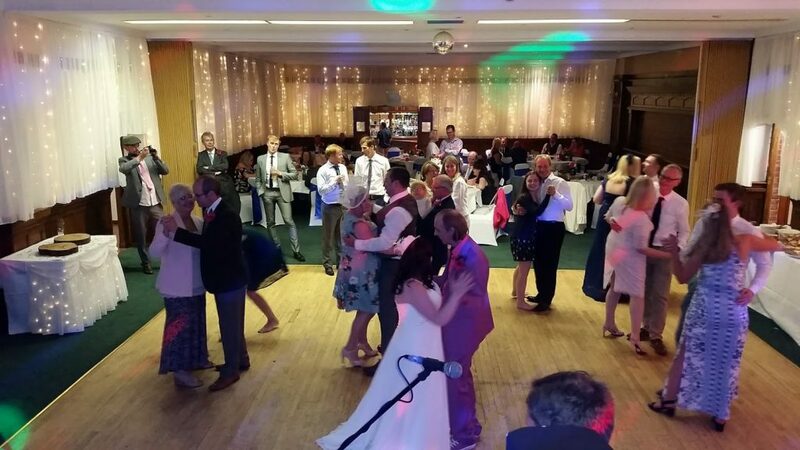 Its the merry month of May and wedding season is in full swing as five beautiful couples celebrate their special day’s with us. 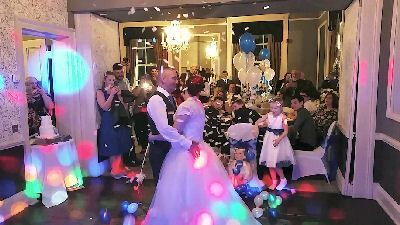 While weddings may be the focus one should not forget the bread and butter events such as adult and child birthday parties. 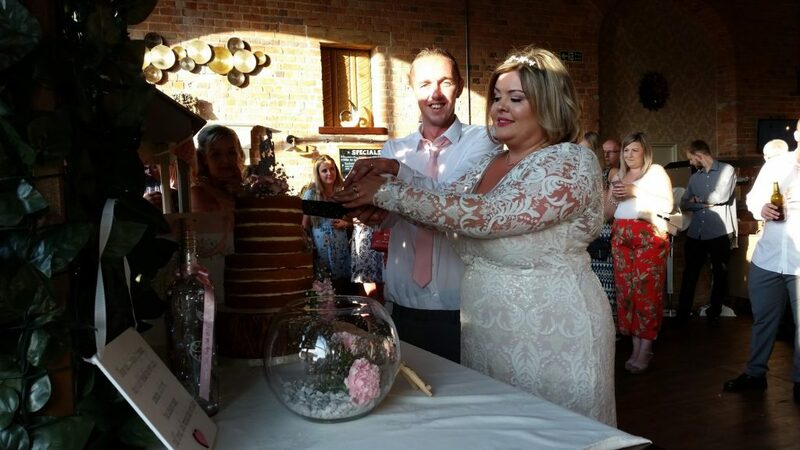 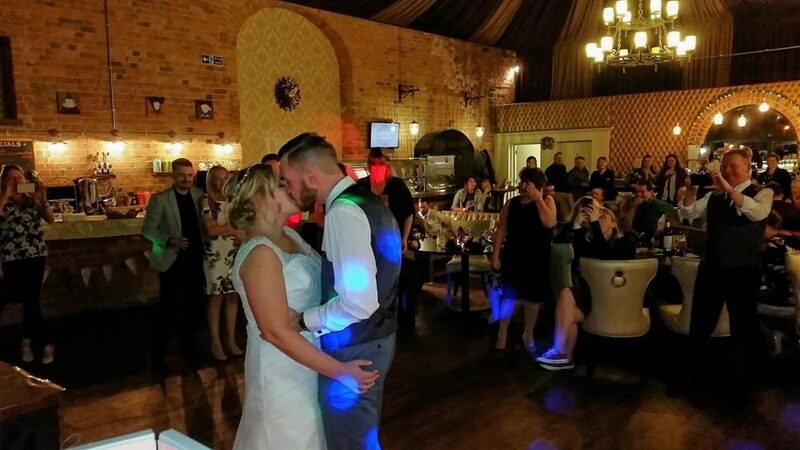 We take a look back at May’s photo gallery starting with the gorgeous wedding of Mr and Mrs Rumsey. 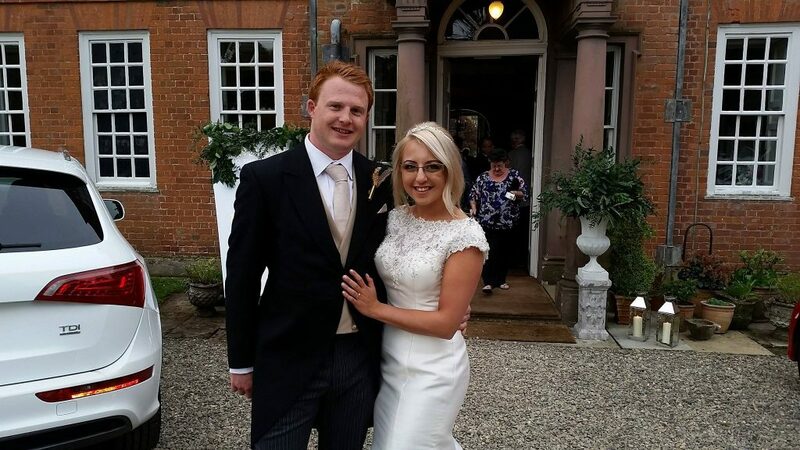 Alex and Helena pose for us in front of this 16th Century Grade II listed Hall. 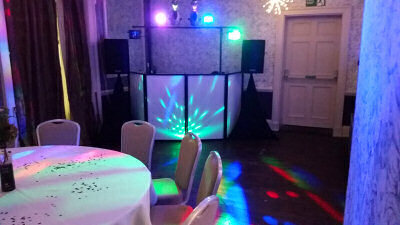 Consequently with a building that old, There was no smoke detectors or internal lighting in the function room! 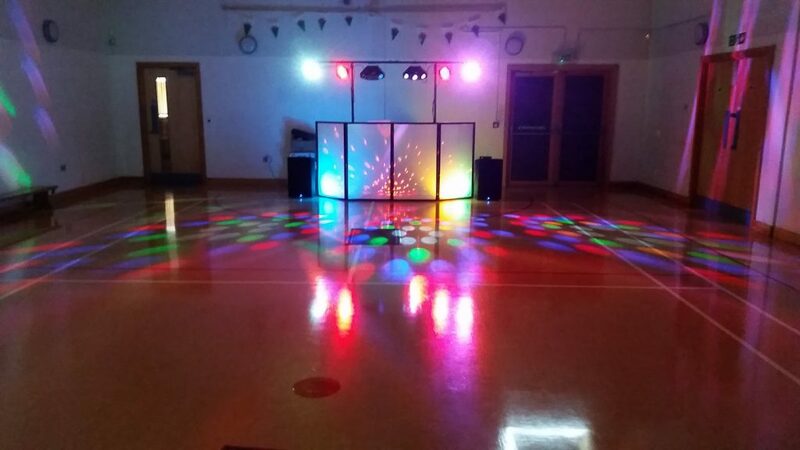 Imagine Mr Rumsey’s delight when we brought out our hazer machine and achieved a truly memorable light show for their celebration. 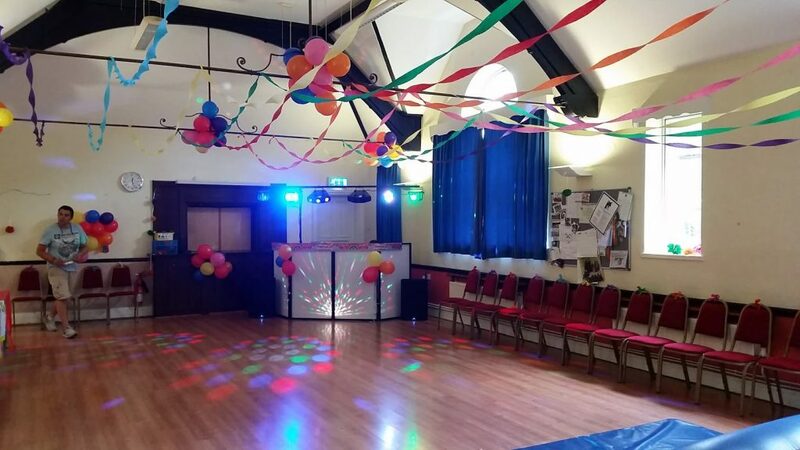 Henley Hall, Ludlow. 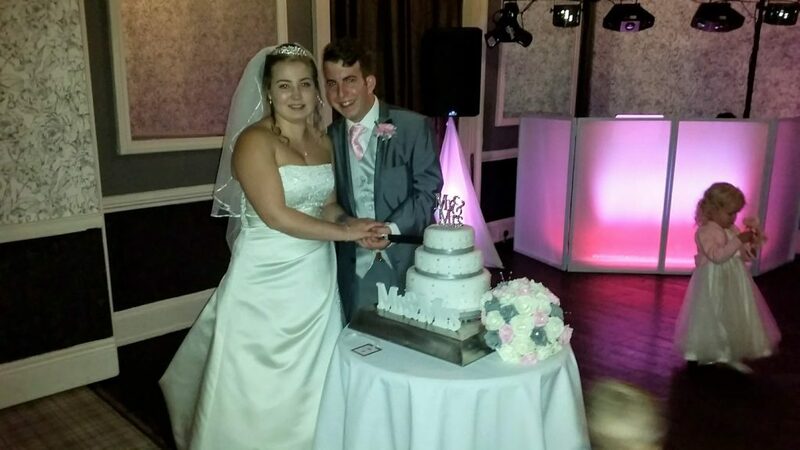 Mr and Mrs Merridth’s Wedding. 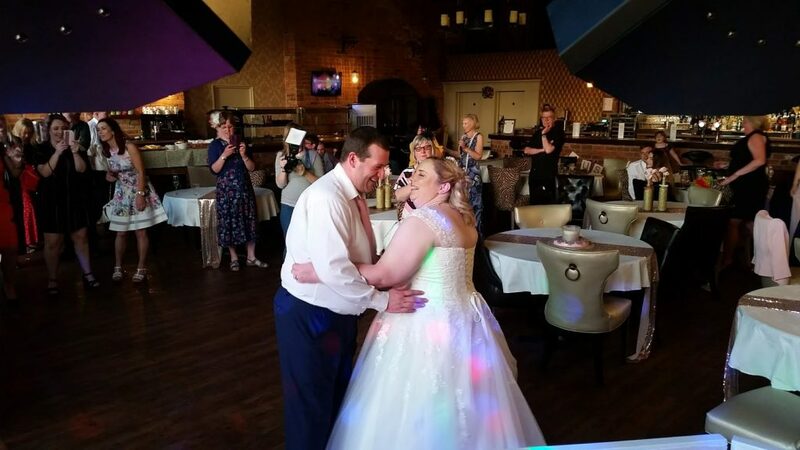 We met with Aileen 12 weeks before her wedding for the consultation and to view their wedding venue. 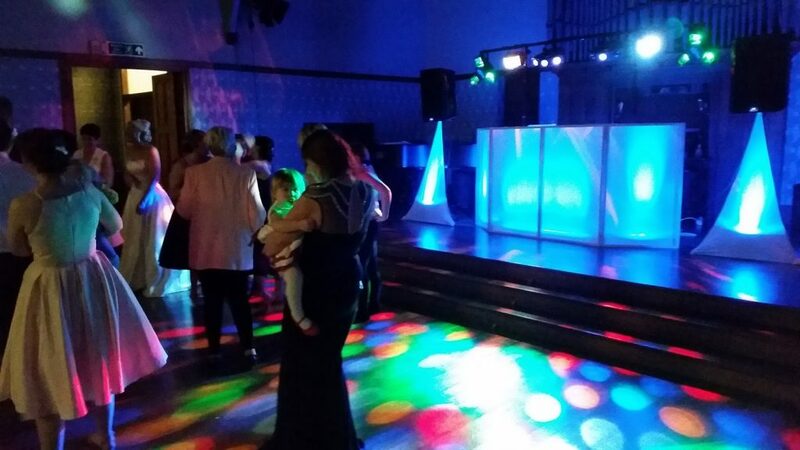 Sadly due to venue closure, She was forced to find a new venue with just 8 weeks notice! 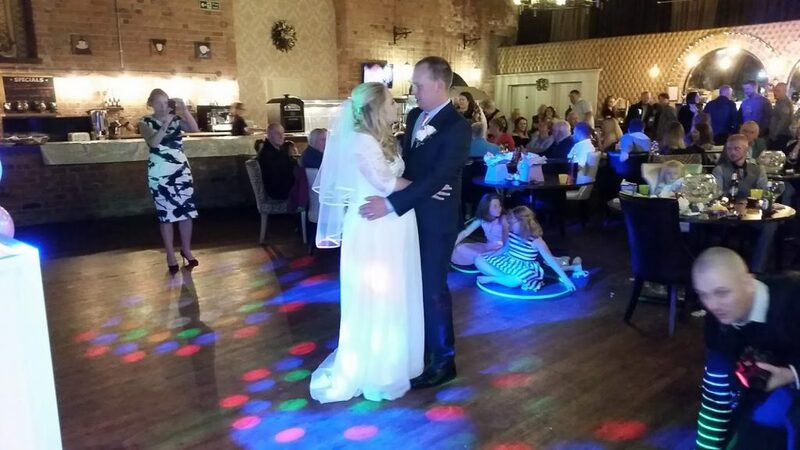 We met her a second time a few weeks before her wedding at The Three Tunns to work out spacing and access. 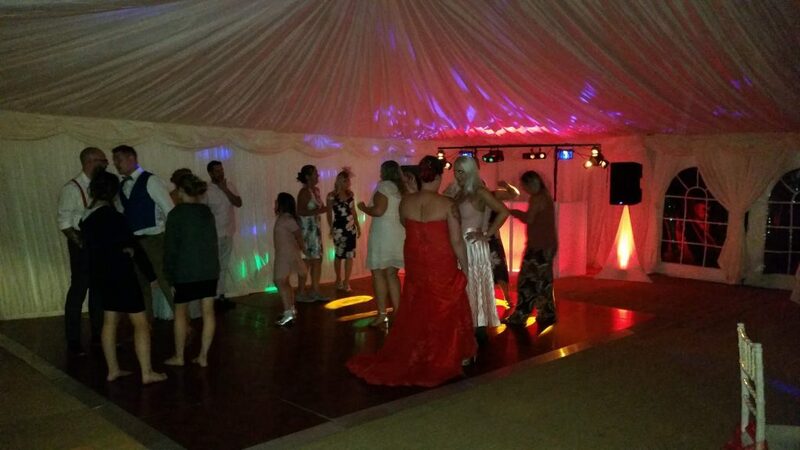 Aileen opted for Red Colour-wash lighting and due to the success of the night, Asked us to stay on till 1 am. 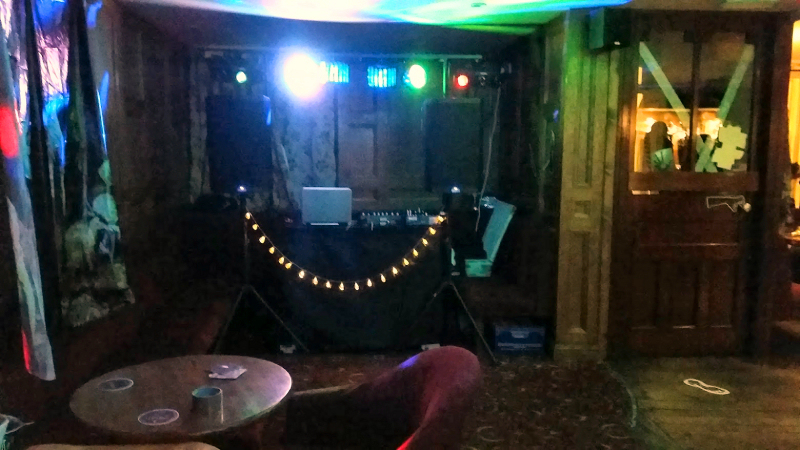 The Three Tunns Inn, Bishops Castle. 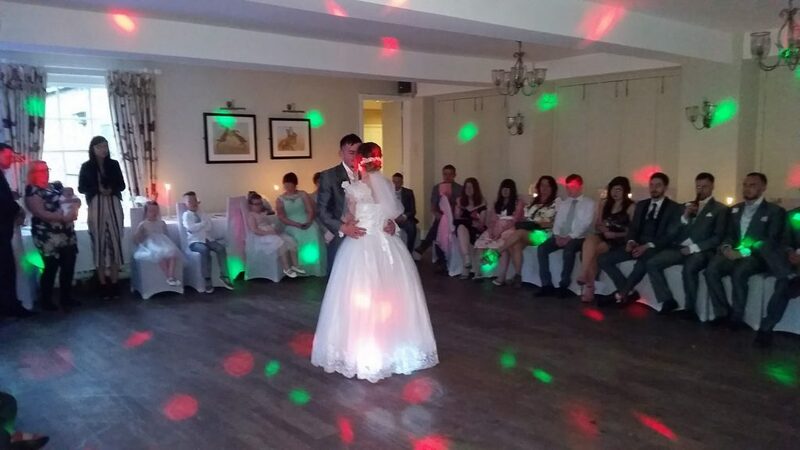 Paula and Ben’s Wedding Reception with Hot Pink Colour wash lighting. 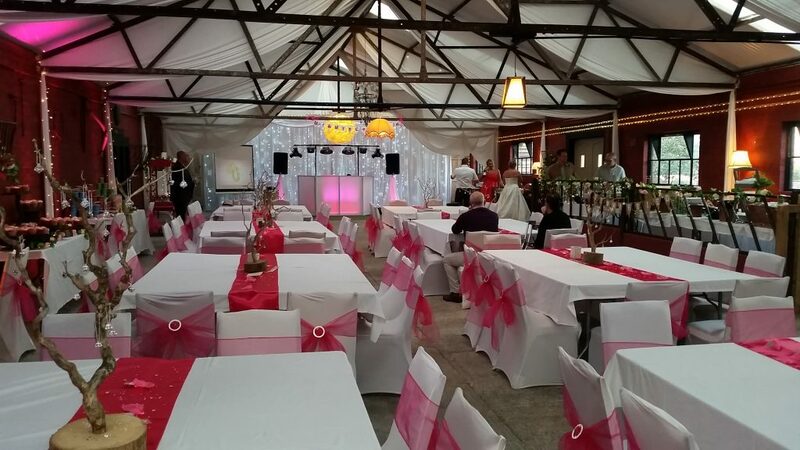 Carriages, Oswestry. 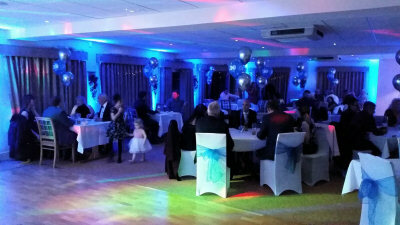 Beautiful wedding reception of Claire and Dan. 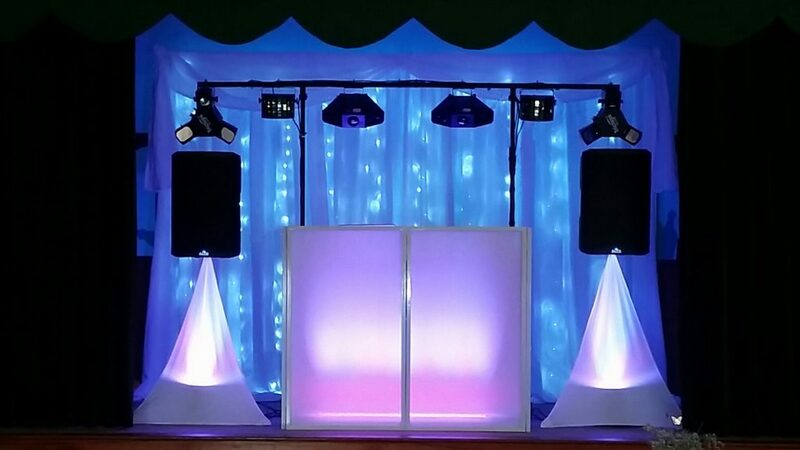 Claire asked us to match our DJ Booth colour to their Pink colour theme. 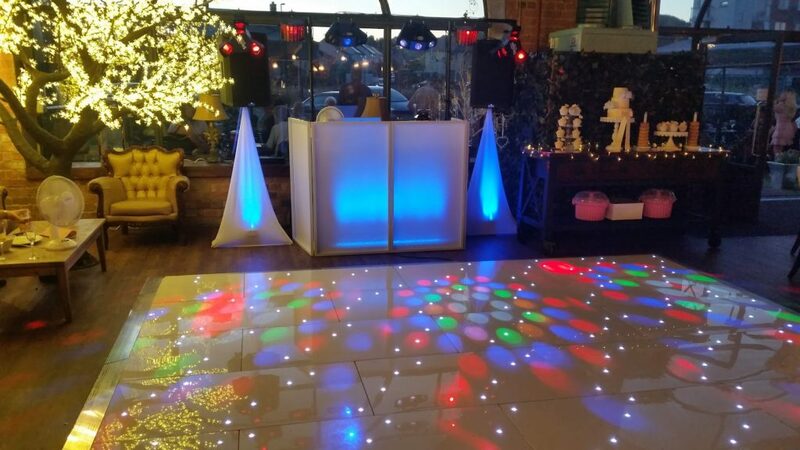 I think we did pretty good 🙂 The Mytton and Mermaid, Shrewsbury. 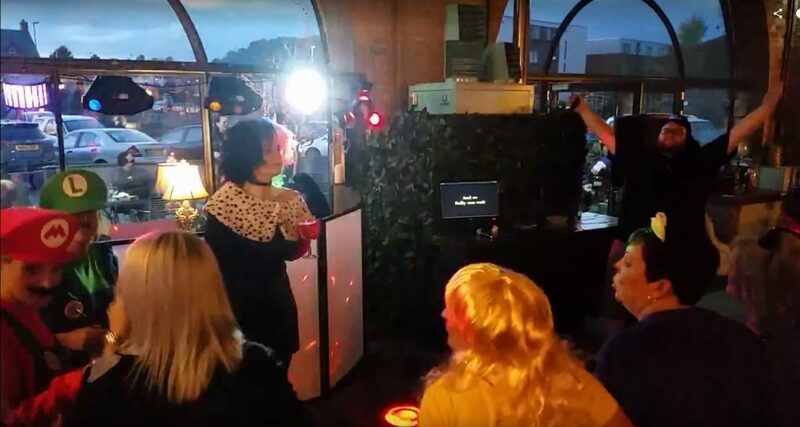 Linzies 40th Birthday party with a 90’s theme twist. 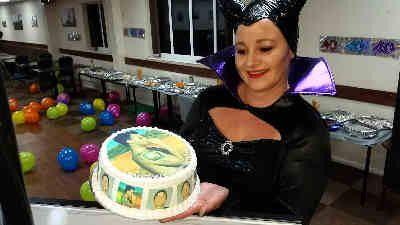 Linzie is sporting the Cruella De Ville look. 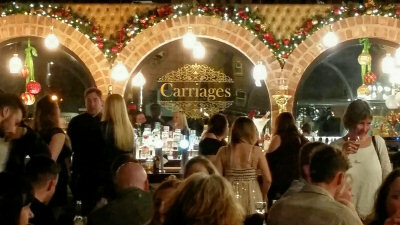 Carriages, Oswestry. 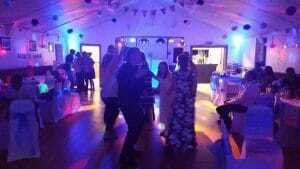 Karen’s 60th Birthday celebration and a gorgeous family photo at Oswestry Cricket Club. 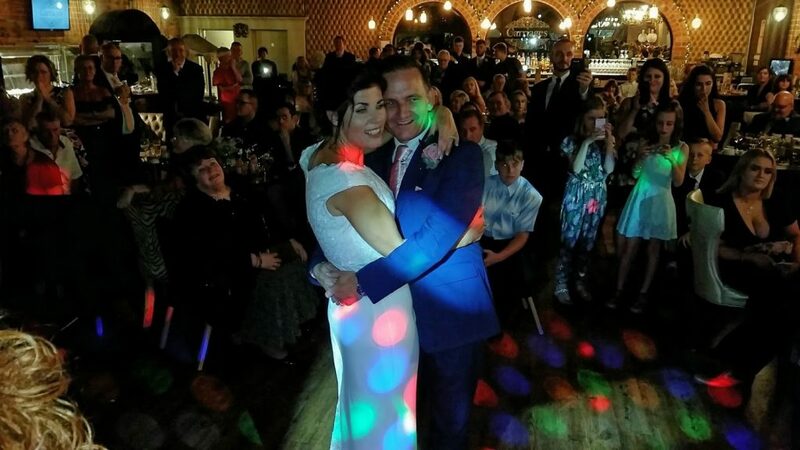 Our Starlit-LED Wedding Backdrop featured numerous times this month, Firstly Mr and Mrs Hayes’ wedding reception coupled the backdrop with our Pink Colour-wash service. 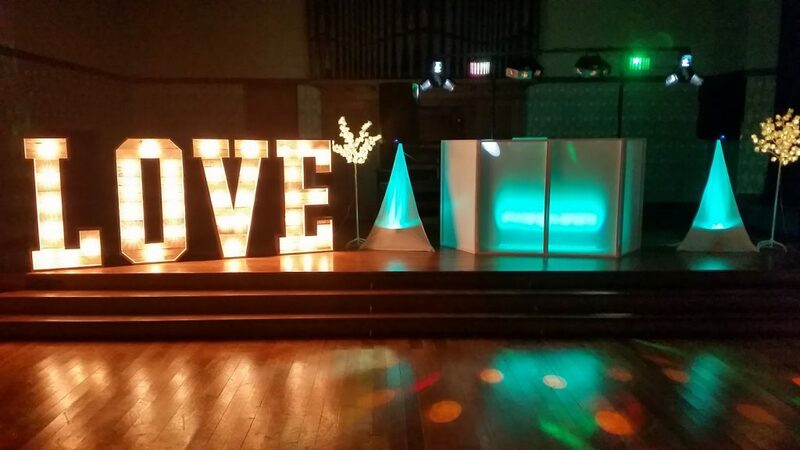 Furthermore the backdrop featured at Barnutopia’s wedding fayre in the same fashion with our colour-wash service. 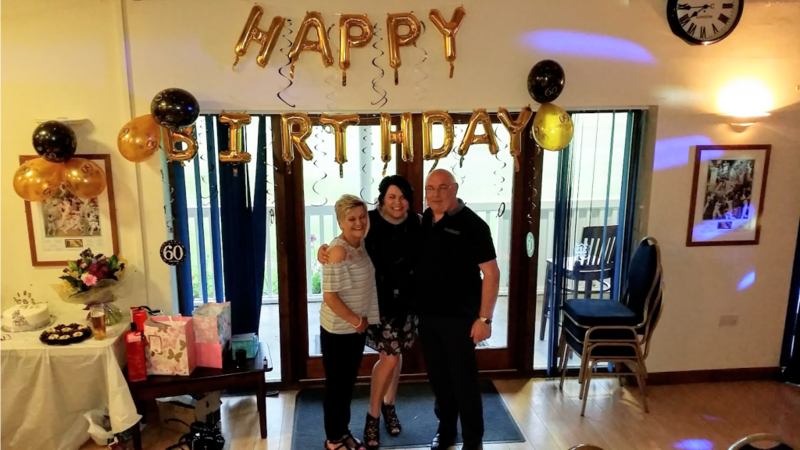 Jannets’s 60th Birthday Party – Ardleen Village Hall, Ardleen. 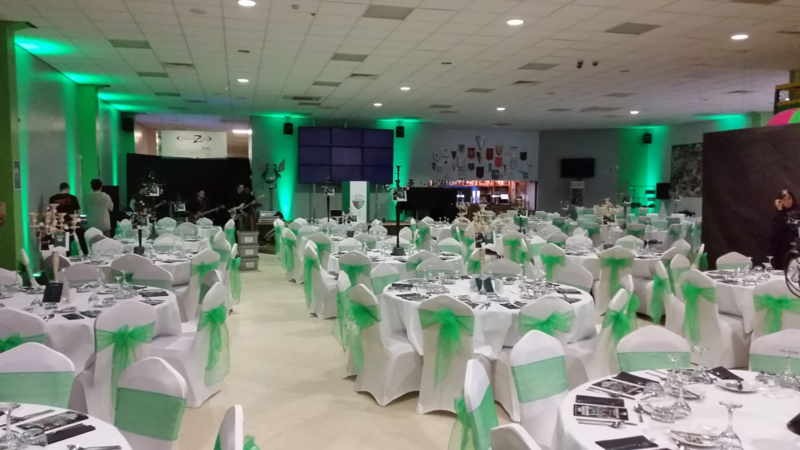 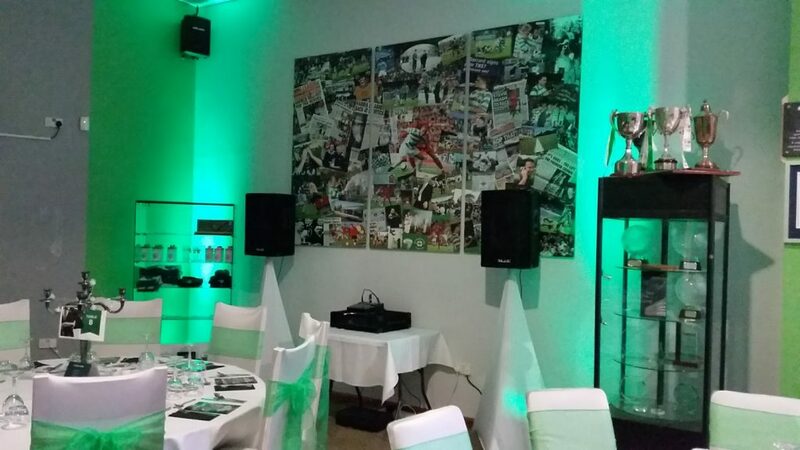 Green with envy, Its the TNS Awards Ceremony, Complimenting The New Saints official colour is our fabulous GREEN Up lighters on Hire – The Venue at Park Hall, Oswestry. 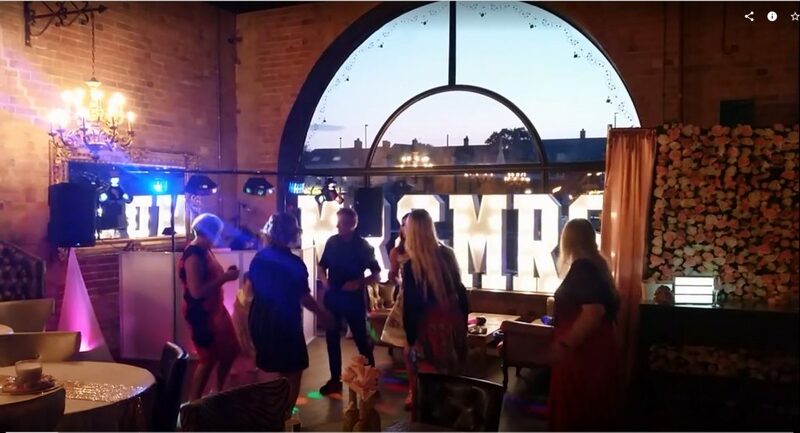 Barnutopia’s First Wedding Fayre. 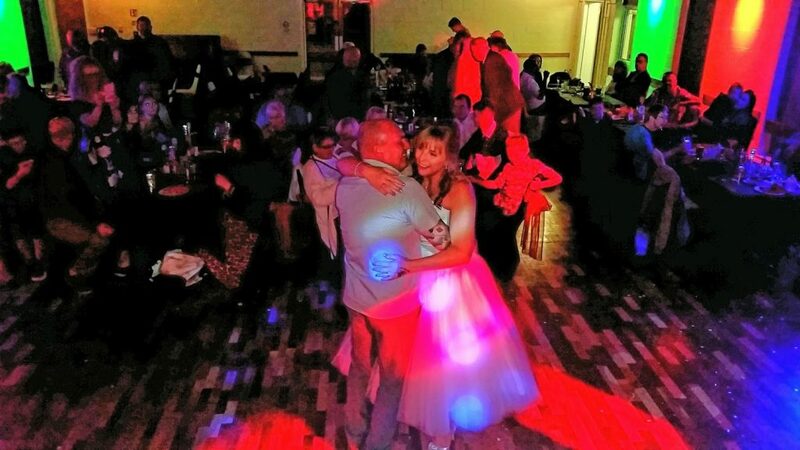 15th April 2018. 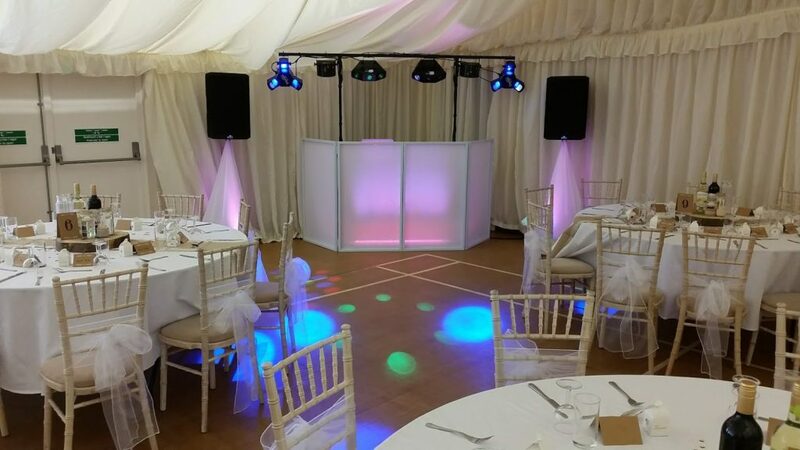 Supporting their official launch, We are the hand-picked wedding entertainment supplier. 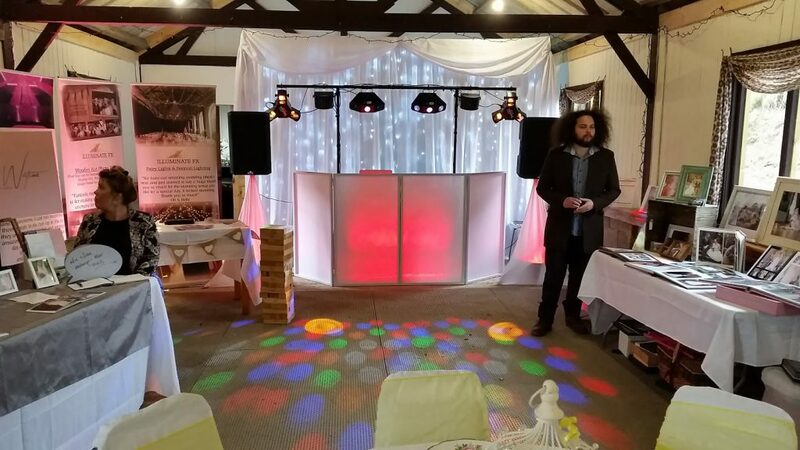 We feature in the Barnutopia wedding brochure Barnutopia, Tanycoed Farm, Llansillin, Oswestry. 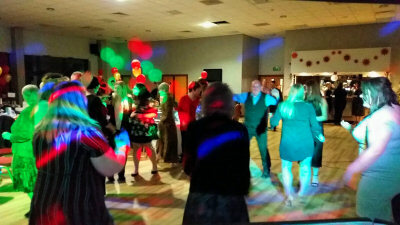 Our very first Gallery Blog post is for March 2018. 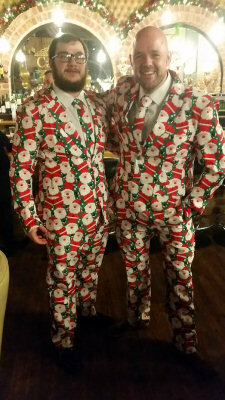 Dominating the headlines this month was the beast from the east chiefly the commuters worst nightmare! 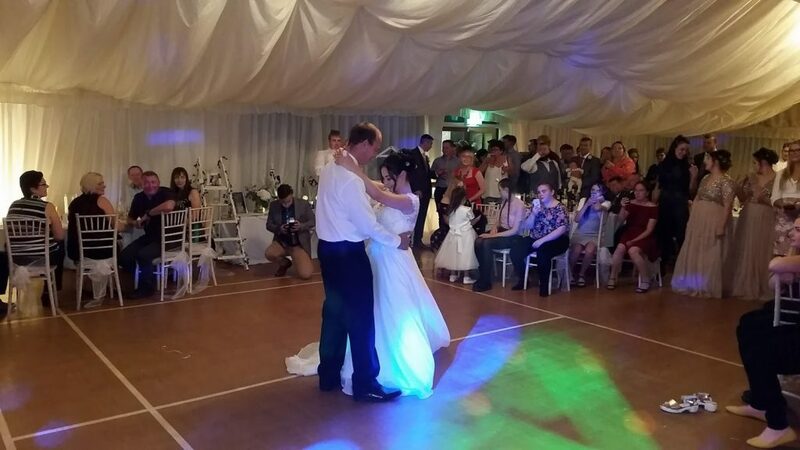 With not one but two white weddings, The Siberian cold and deep snow was challenging enough to drive in but when confronted with a dead battery on the van the only recourse was to push start it. 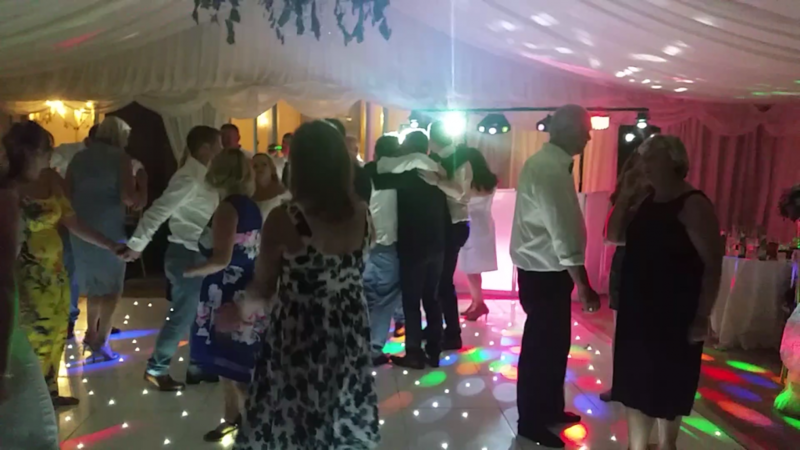 A heavily loaded van is dead weight when you have zero traction to push it, nevertheless we did it and despite the weather got to every booking. 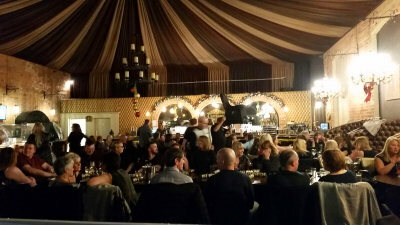 As they say… The show must go on! 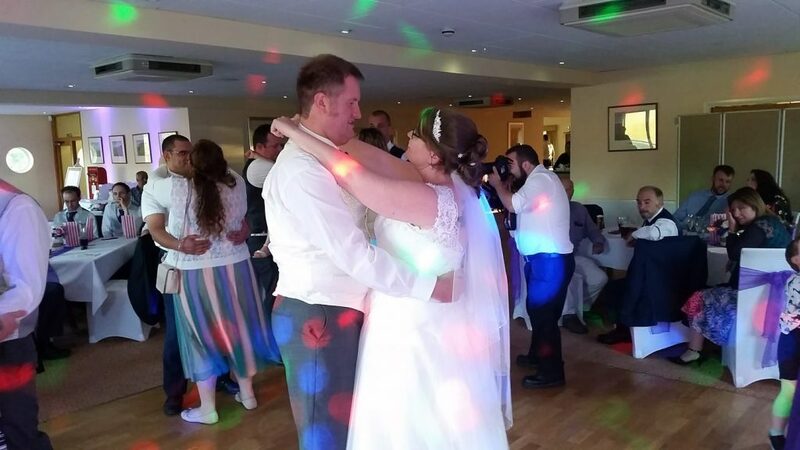 Jodie and Jamie’s Wedding was the first to be effected by the snow, however the couple chose a vibrant purple colour theme and celebrated their day. 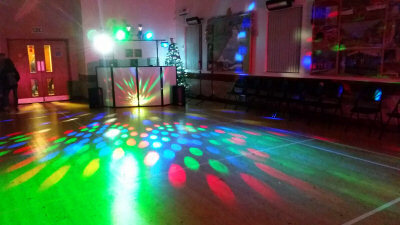 Sweeney Hall, Oswestry. 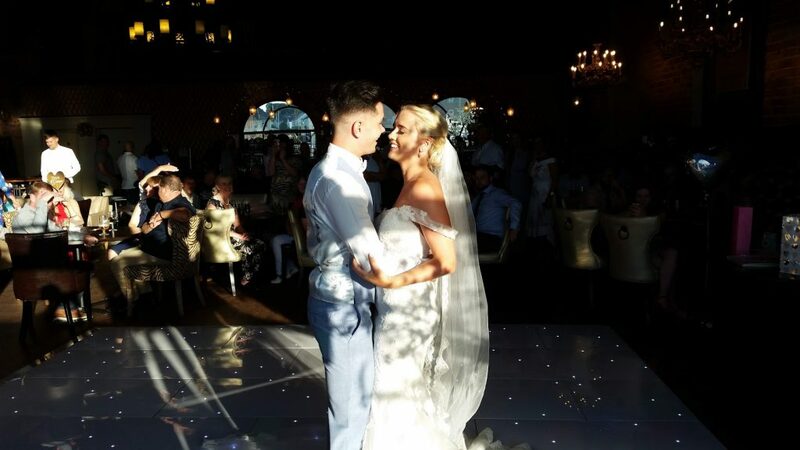 The gorgeous wedding of Vicky and Stuart. 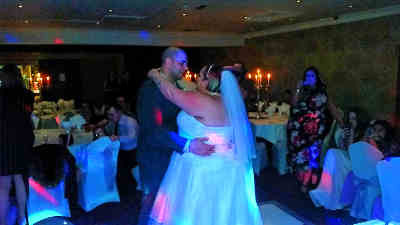 Their first dance is pictured below and the choice of blue colour-wash mood lighting was stunning. 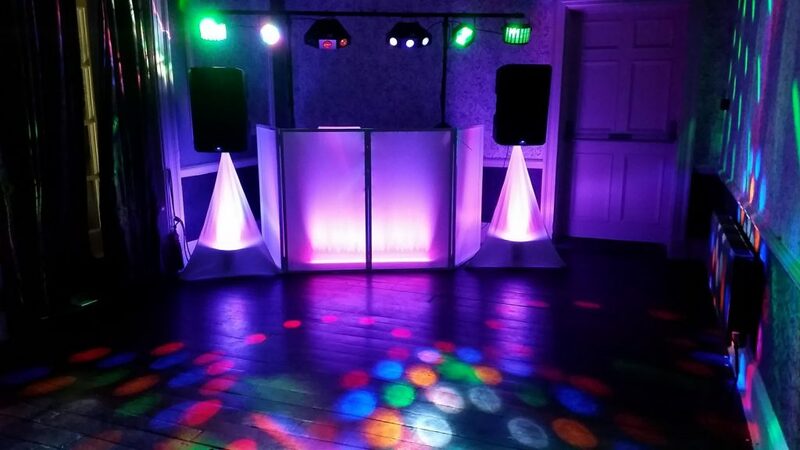 Gregynog Hall, Newtown. 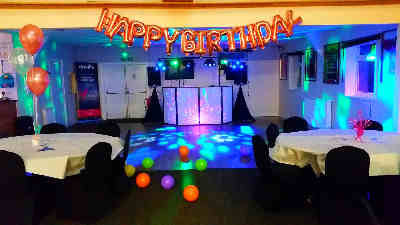 Amanda called us a week before her birthday party in a panic as her previously booked DJ had cancelled on her. 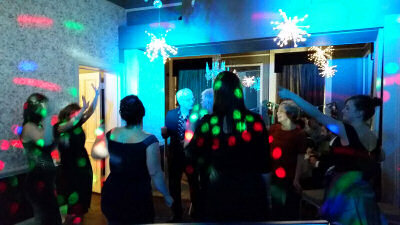 Stepping in to ‘save the night’ we very much enjoyed it! 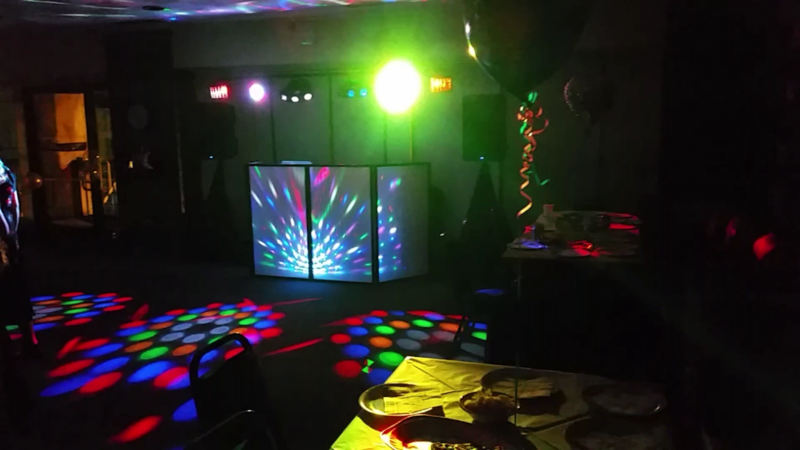 Facebook Video flashback of Amanda’s 50th Birthday – Town Hall, Welshpool. 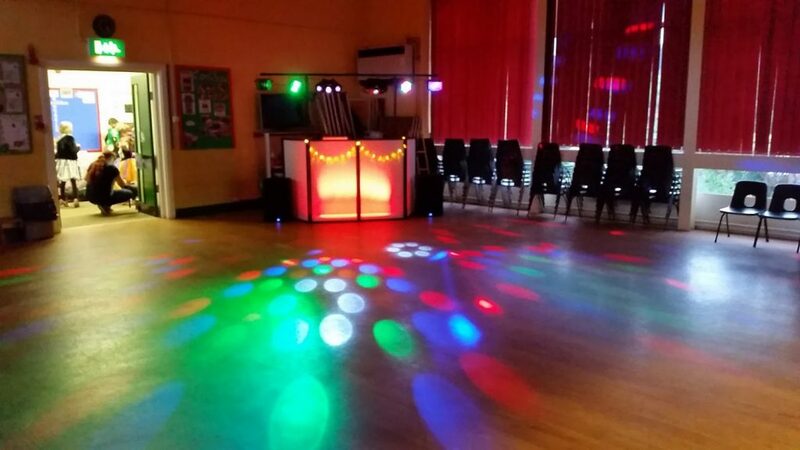 Bryno Offa School PTA asked us to host their spring disco. 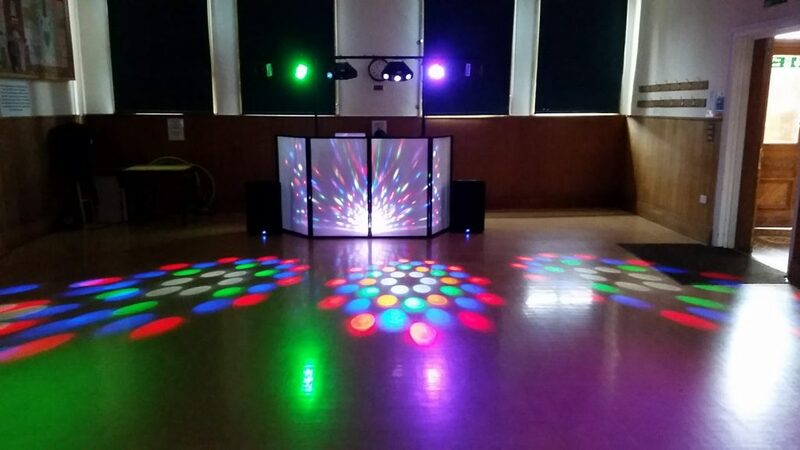 Bryn Offa School, Pant, Oswestry. 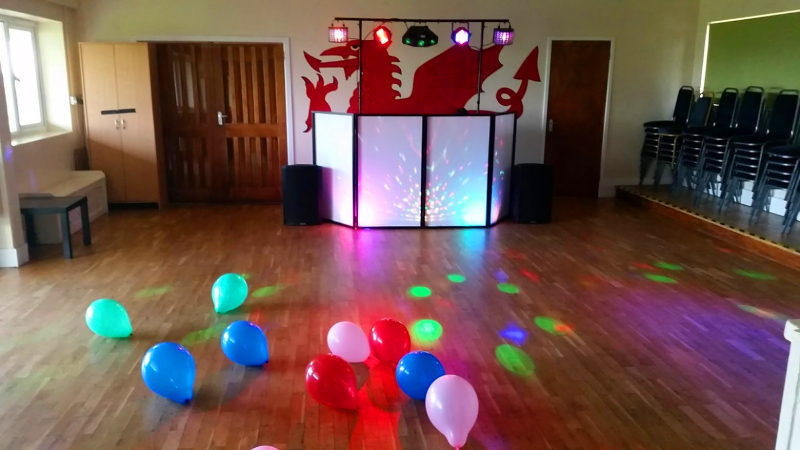 Jarek’s 10 Year old ‘Teen Birthday Party’ – Glyn Cerriog Community Centre, Glyn Ceriog.